Tonga instantly set itself apart from the other islands we’ve been to. Not only because it’s an actual island and not an atoll, but because of the unique labyrinth you have to sail through to get to the harbour of the main island itself. 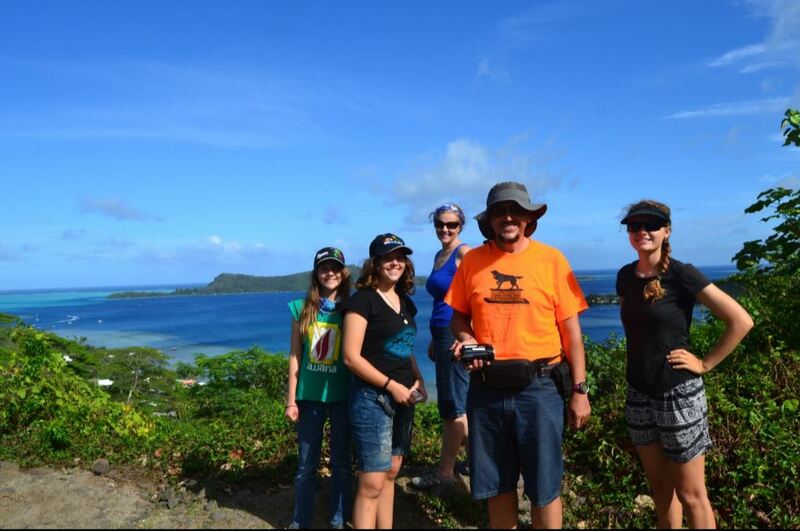 We stopped by the Tongan island named Vava’u. We came round to the harbour, sailing past the sheer cliffs on the one side of the island. An impressive sight indeed. The mini labyrinth along the one side of Vava’u wasn’t particularly hard to navigate, but the first time I was confronted by it, it was pure confusion. One of the most fascinating things was that the islands weren’t following the usual pattern of beach, leading up to a rather flat, jungle-infested middle, that we were used to in the Tuamotos. They looked rather more like cakes sticking out of the water, with a frosting of jungle on top. Chocolate cakes, obviously, because of the brown rock colour, and mint frosting. 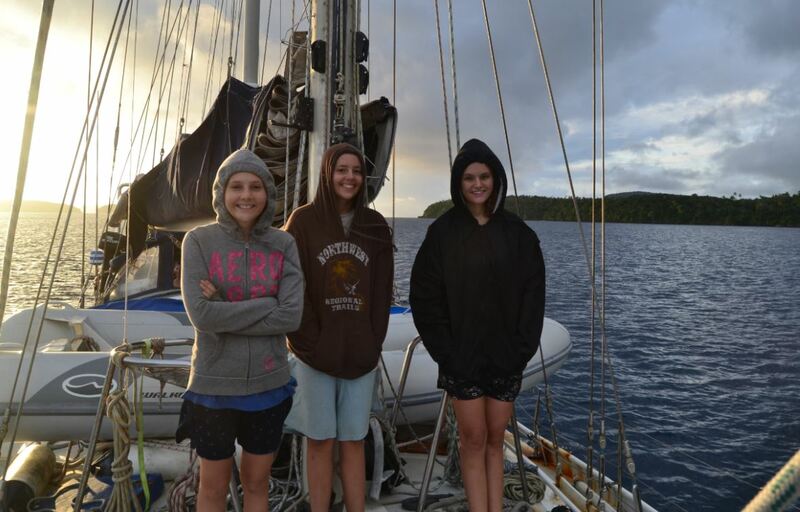 Vava’u was also rather chilly on arrival as I remember. Us four girls were sitting on deck wearing jackets on the cool, overcast day. A luxury which is classified as rare in the tropics. Even when it’s raining. But it turned out to be mostly caused only by the overcast weather of the first few days. And it really did rain on the day of our arrival. Just as luck would have it, it started pouring as we were forced on deck to moor the boat to the customs dock, so naturally we all got wet. We anchored in the main bay for a couple of days and did some sight seeing on land. 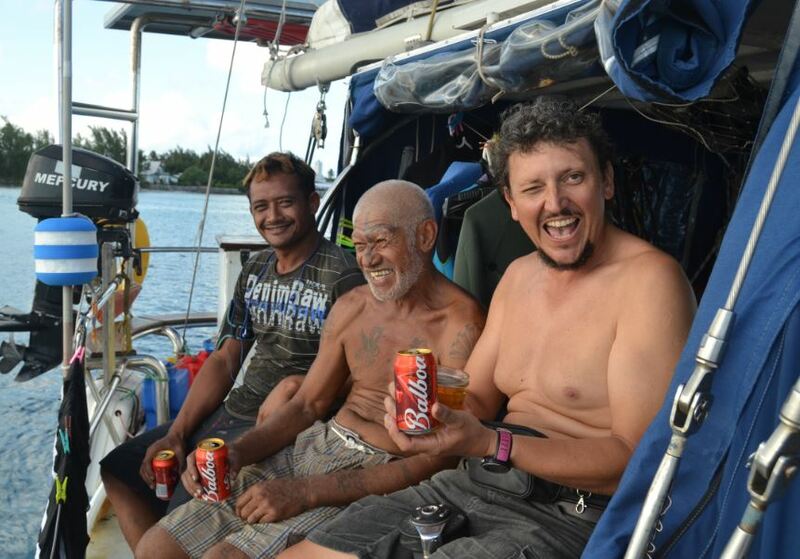 We bumped into some sailing friends we’d met in Trinidad, which was random. And did an island tour in some guy’s Taxi. The taxi car looked more like those we get at home, but private… I guess you’d call them a van… But anyway. He took us around to some magnificent viewpoints and along some paths that rarely get used. I was wondering if we’d fit through all the jungle growth that was threatening to close the road. not the best example, since it wasn’t taken at the right time. But imagine the growth beside the road higher and greener and wilder, and while you’re at it, just put a few wild boars dashing across it being chased by a rather fat Gaul and a rather short Gual, both with ridicoulusly large noses. We stood at the top of the cliffs that we had looked up to when sailing past and admired the big blue ocean that stretched out for miles. My Mom always thinks it an intimidating view, seeing so much ocean and thinking “What crazy people would go out on that, with a boat! ?” while knowing full well, that we are those crazy people. But to me it’s an intriguing sight. Not necessarily because I love the sailing as such, but just the idea of there being so much world out there that I’ll never see, and I’ve seen a fair deal of it. But the world is just so large, filled with so many wondrous things…. 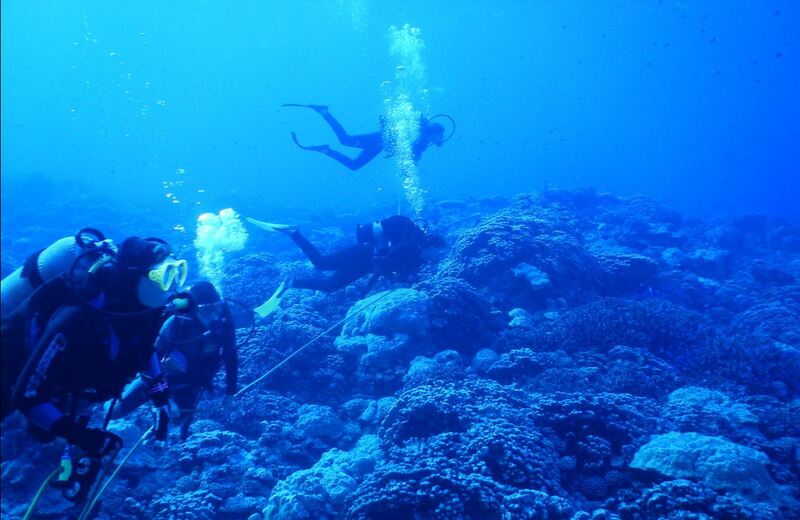 Of course we scuba dived in Tonga as well. I mean, my Dad’s the captain. What do you expect!? Our first dive was in the bay itself, the vision was poor and the water was cold. I wasn’t too keen on it myself. 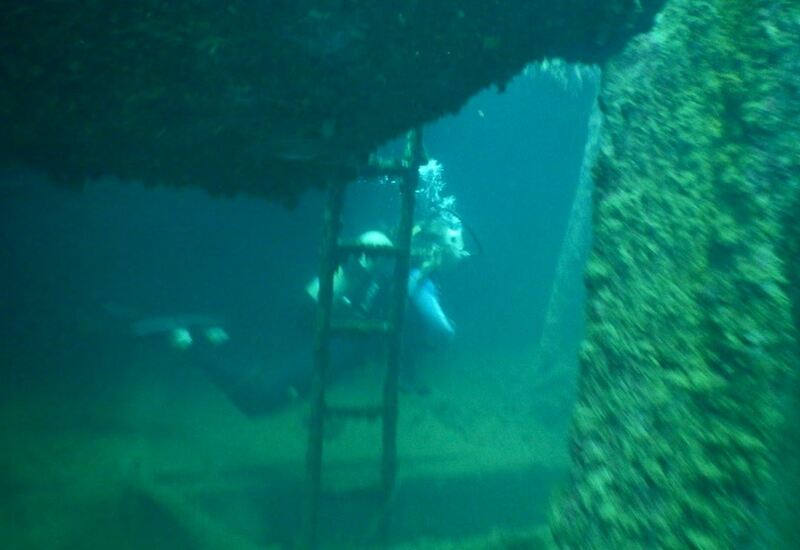 I particularly dislike not being able to see the bottom before lowering myself into the depths. A vague darker and lighter of rocks is good enough, but nothing but green water..? The worst is when you’re halfway down and you still can’t see the bottom, but you also can’t see the top anymore. And you’re just descending some more! Despite this, however, I managed to enjoy the dive as long as I didn’t try and look up once we reached the wreck. The vision wasn’t that bad, taking into account some dives we’ve done. Nobody got lost, we could still see each other at a distance of at least five meters and we knew we’d all stick to the wreck, so you couldn’t really get lost. Although my Dad freaked me out by diving into the belly of the wreck…, ok not really, Dad always likes exploring the dark caves, I guess I can’t imagine not being claustrophobic in such a situation. But somehow, he manages not to get a panic attack, and Dad’s got a lot of diving experience, so I guess he’s allowed to do it. But enough talk about diving. The next big and main event of Tonga was the Whales! Tonga is one of the two only places where it is legal to swim with Humpback whales. The other being off the coast of Australia somewhere, but’s it’s only as the whales pass the continent and you have to go far out to sea in a boat, whereas in Tonga they come to the reef protected areas between the cake islands (take note; the ‘cake islands’ are not their official names, I’ve invented it on the spot, so it won’t help in a google search) to give birth to their young. They’re right by the coast, and to boot, you’ve got a chance to see a baby whale! Now to all you people out there gasping with dismay and sympathy for the poor baby whales and new mothers being bothered by all these pesky clumsy land fish. 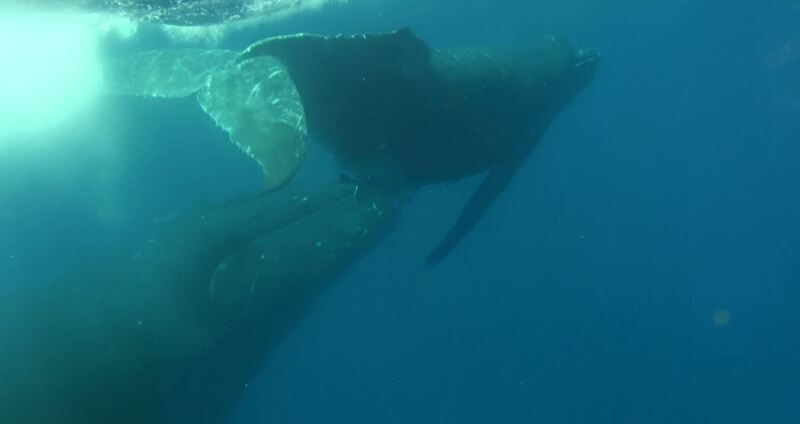 The rules are really strict when swimming with them, the whales are thoroughly protected by all kinds of laws, and though it may still not be the most comfortable for the whales, their alternate fate could have been much worse. A few years ago (anything from 40 to 3 years, I can’t remember) they had a decision to make. They could continue hunting whales as they had been doing for a long time, or they could stop and make it commercial to come and swim with them. So see? The whales are safer and when they get tired of the people they just dive again. We know, they did that quite a few times. We, as you might have guessed by now, decided to do the right thing and go on a Whale watching trip. We got to swim with them! but just so you know, they swim super fast! When the operator sees a whale, the boat goes a little ahead of them and then we all (four people and an operator) jump in the water and swim as hard as we can towards the path the whales are estimated to cross. The viz wasn’t as good as it is on the commercial photos, we didn’t get the best day, but it was still super awesome. when chasing the whales to get a glimps, it would be like… no whale…. no whale… no whale… and then suddenly BAM! there’s a whale. Whales, in my experience always disappoint me when I see their size. You hear they’re the biggest creatures on earth and you begin to imagine a Leviathan, but honestly they’re not that big. Then again, as this experience has taught me, When seeing them off the boat you only see their back or their tail. There’s still plenty of whale submerged underneath the water. Having seen the submerged part now as well as the back and the tail my faith in them being huge creatures has grown a little more. They’re still smaller than I always see them in my mind’s eye. But still, they’re big. It’s amazing to see the whale. We even saw a little one. 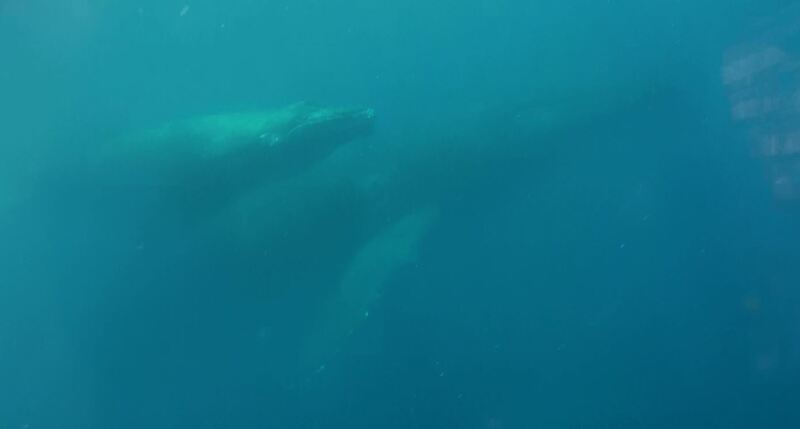 The barnacles on the mother’s back… especially with the bad viz you’d swim and look, then suddenly see this wall of whale. Amazing, to see the whale’s eye… it was magical and again eye opening. It’s mind boggling when you think that we, as humans don’t have enough imagination to invent entirely unique animals and creatures and patterns and things. No matter how original the creature of our imagination is, it’s always based and inspired by something we’ve seen or read about. A collection of known pasted together. The whale tails. The classic veiw we would get becasue of their speed. And yes, that be a baby whale mate. The Greeks did it super obviously in examples of their mythological creatures like centaurs and unicorns. I don’t know if they knew about the narwhal, but none the less, they weren’t the first to stick a horn into something’s forehead. but even with other stuff… We don’t have the means to invent something new. We invent a pattern and then you think you’re the first! 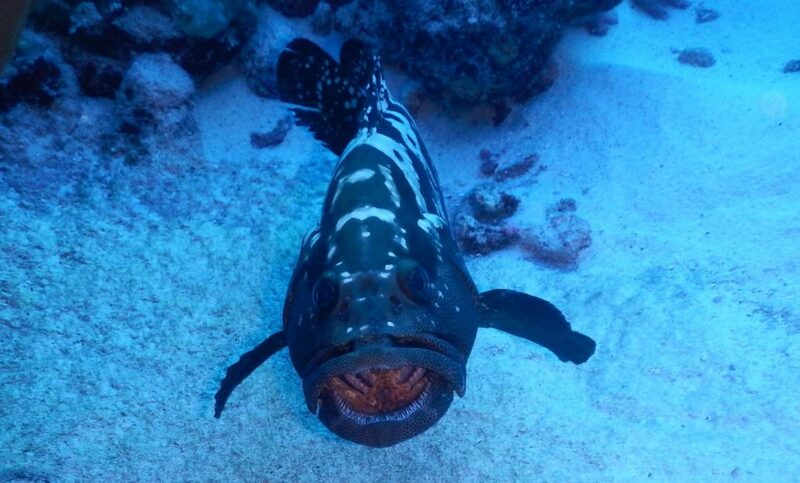 But then you see a fish, and it has the same pattern. We have a limited scope to look for, limited puzzle pieces. We cannot create more pieces. But God created all the pieces before there were other pieces to base them on. All the uniqueness from a Kangaroo to a Whale. An ant and a lion. It’s awesome when you think about it. We moved anchorage after that. Out to the more scenic cake islands, and small bays off the main island. We got out to clearer water and did some awesome diveing. We even made some cool friends who had rigged an awesome swing on their boat (they call it their ‘kids atractor’ or something of that sort). And we lived in a state of happiness. Perhaps, for me personally, it was because of the little internet. 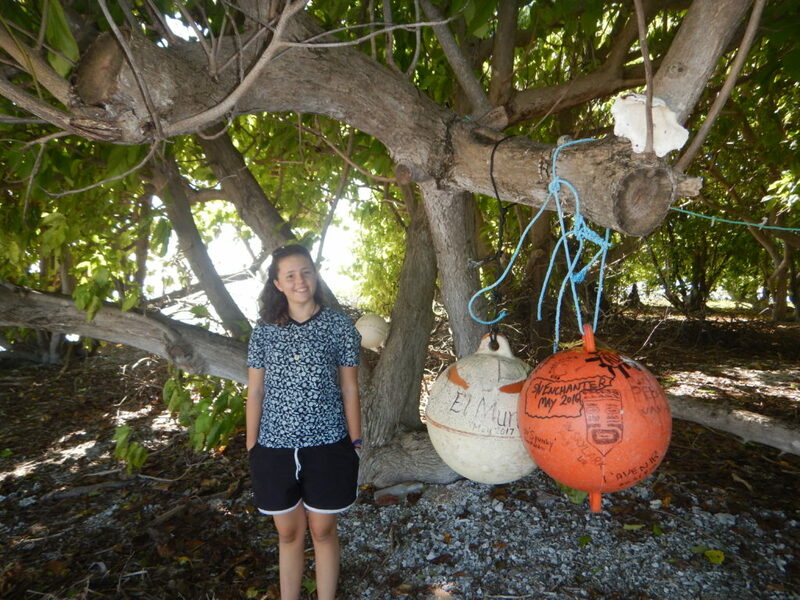 Sophia and I went kayaking more than once and found the perfect place on land in which to make a ‘fort’ as we had done in the Caribbean with some other sailing friends. This location would have been ten times better, but sadly, we spotted a sea snake slowly climbing up a rock wall, pushing its head into holes, presumably to find tasty morsels of sea snake food. This ruined the place for us forever, which was sad. It would have made a truly awesome fort. We have a glass bottom kayak named Panama Piesang (the last word is Afrikaans, if you speak only English you’re guaranteed to pronounce it wrong). 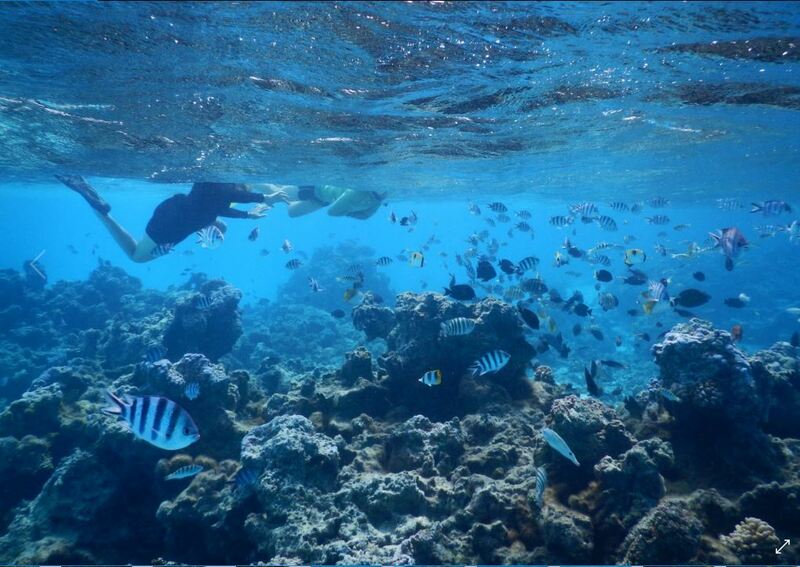 It’s really amazing to paddle over the shallow snorkelling reefs and see the fish underneath you. It also, however, makes for a good view of you crushing all the corals hopes and dreams when you sometimes accidently go too shallow and hurt them. Today I will take you to the island Suwarro. 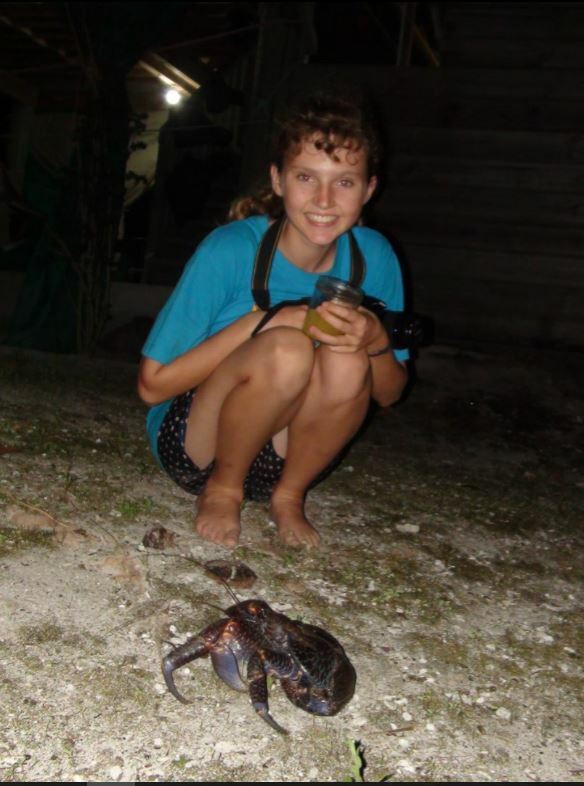 This was the first and last island where I saw coconut crabs. 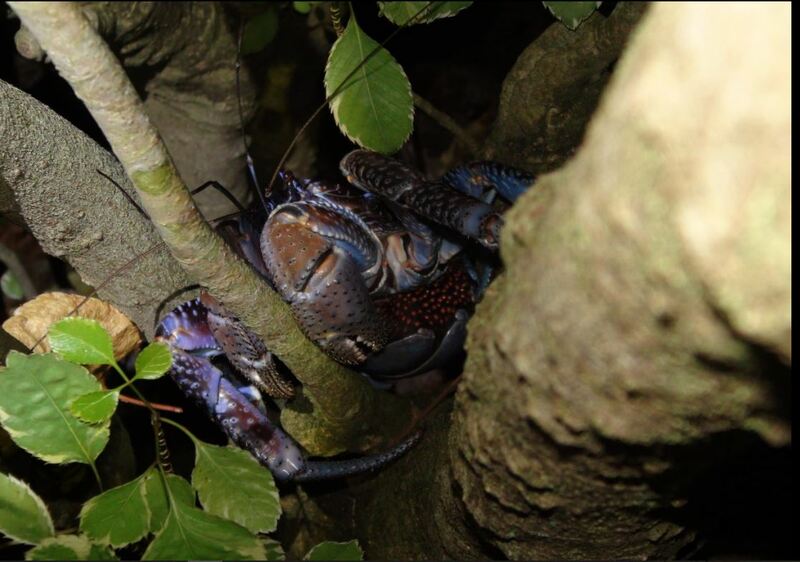 Coconut crabs are named so because they have very strong claws that can break open a coconut and they can even climb trees! This is kind of freaky because they are big. But that is not all you can find on this island. There is also the perfect swimming water, the only downside about it is the sharks. They weren’t that big but still half my size, and they followed you around too (probably because people spearfish even though it is not allowed. Suwarro is a wild park reserve ). So, you sort of jump out of the water when you are done swimming, because you can’t see them when you climb up the step ladder. So, instead of standing on the step ladder half way in the water and taking off your fins and goggles and putting them on the swimming platform, you dive down and then go up as fast as you can, and jump out onto the platform seal style and it turns out that is the funnest way to do it ;P . So anyway, back to the Coconut crab adventures and other Stories. 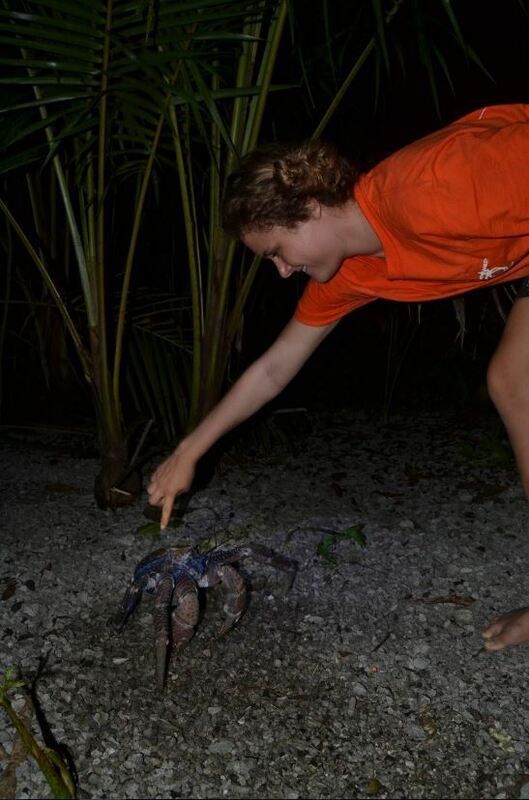 Ever since we were told that we might be able to see coconut crabs I kept on wondering what they look like (I am known for my curiosity). So, when we at last got there and my dad asked the familiar question of who wanted to go with him to shore, I said yes at once. Not just because I wanted to see them but I was a bit tired of being on the boat. 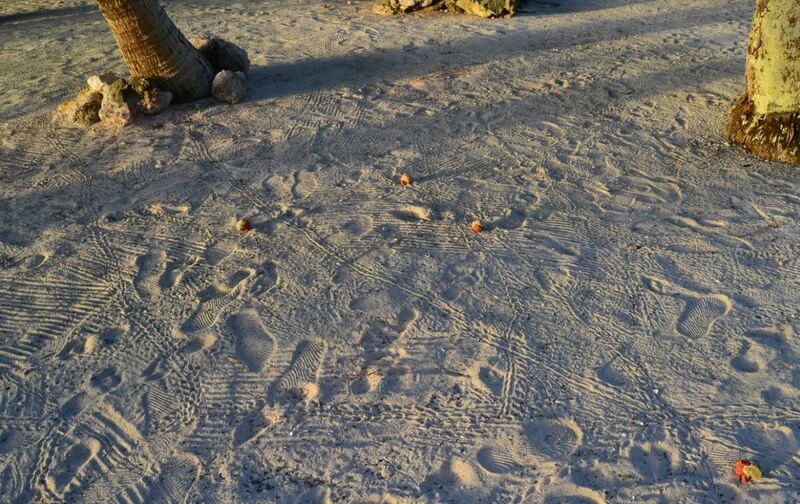 The Hermit Crabs leave their footprints everywhere!! Now I must give a little bit of a background I think. There are two rangers that make sure that everyone obeys the park rules. They are taken there from their island with a boat that drops them off on the way to some other destination and they stay there for 6 months! With only the occasional cruising yacht that visits, it is literally as if you are at an uninhabited island. The one ranger liked doing things and making things and kept the place where they live in good order. He would clear the beach of leaves and he made hammocks out of fishing nets that washed up on shore and some wood that was lying around. He would make all sorts of things out of things he finds that washes onto the shore. When you look in between the rocks or in the coconut tree stumps (they actually eat it – it is one of the things that they eat) you can find them in shells as big as your fist and they can never properly retreat into their shells. It is kind of funny that in the day there wouldn’t be one in sight, but when the sun starts to go down and in the night you cannot help but step on them, there are so many! 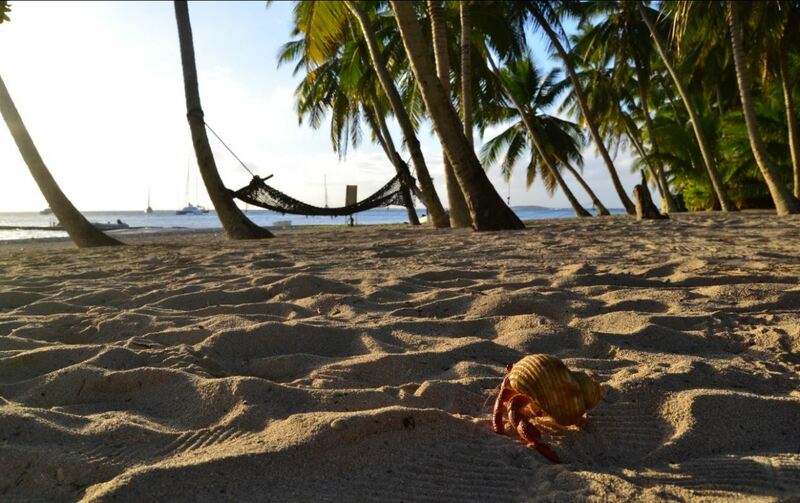 I found it funny when we had a potluck on the beach once with other cruisers and the sun was going down and we were braaing (BBQing) the meat and the next thing we saw there were so many hermit crabs out, slowly and silently making their way to us. 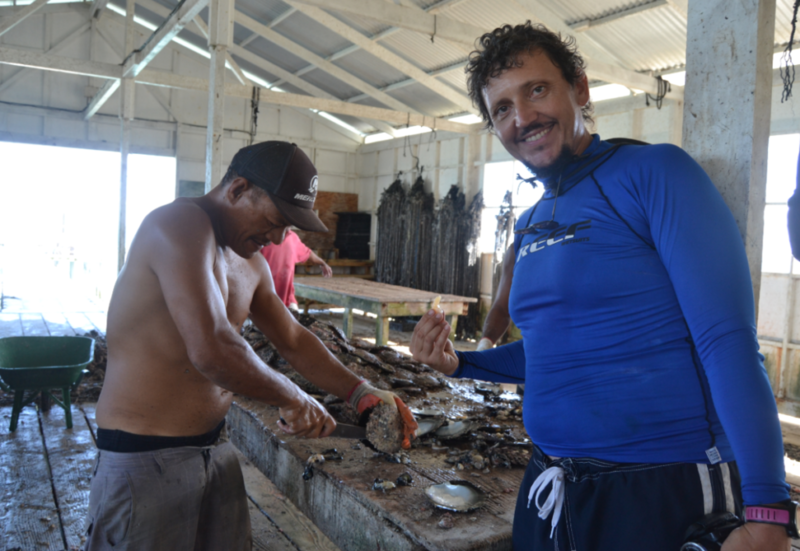 The meat was the centre of attraction for millions of hermit crabs and afterwards we let them have the bones that still had a little meat on them. Then the ranger said that he would take the people that wanted to, to see if they could find some coconut crabs . So our family decided we wanted to see them, but the other cruisers didn’t want to go back to their boats with low tide in the dark. So we got two flashlights and went to the back of the clearing behind the place the rangers live. This is where we looked for them …. 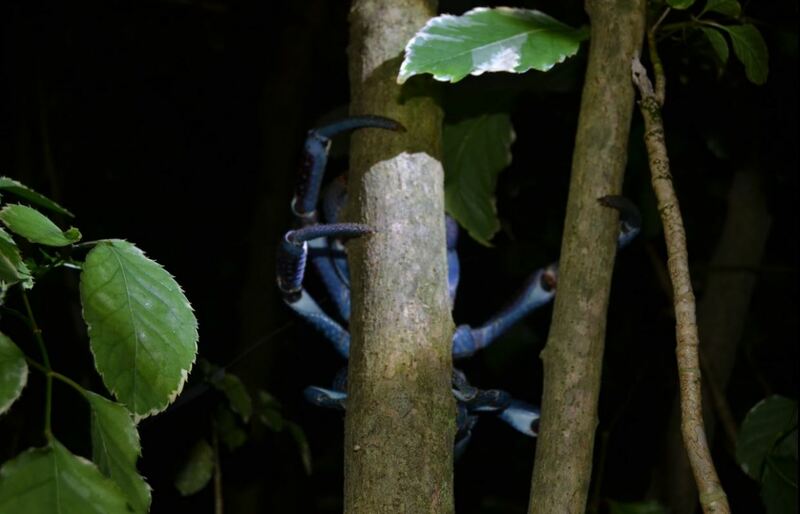 It turns out that they look like a lobster and normal crab mixed into one. They also come in the colours : Blue Purple and Red Orange. 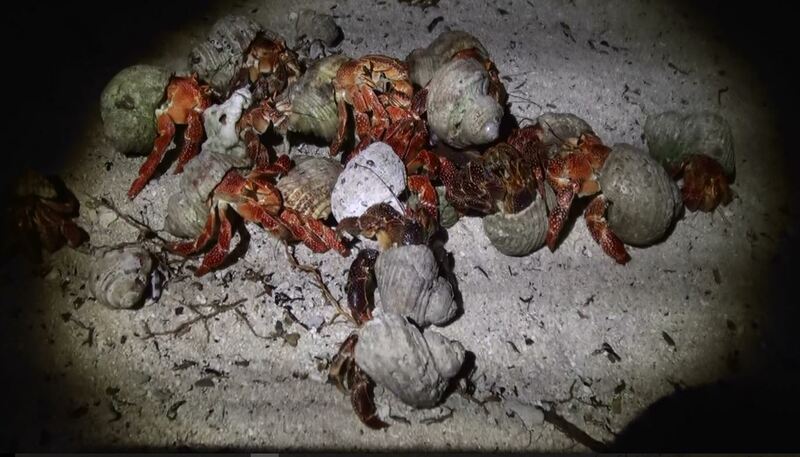 Like the hermit crabs they come out in the dark. We would see one and go closer and the ranger said that we could touch them. Naturally Franci and I tried. Just as I was going to, he or she, moved backwards like a lightning bolt and I definitely didn’t expect that (you have to know they have really REALLY Big claws ) So, I didn’t try again for a long while. And then we went to a place where the ranger put out some broken coconuts that the crabs come to eat and big ones so off we went to look. While Marike was petting a Big Orange and Red one and I looked on from a distance, Karin J said to me: “Don’t panic, but there is one behind you.” So I stood and turned at the same time and saw that it was literally just behind me and sitting all nice and still, so that I didn’t see it when I first sat down. It was BIG!! I had a VERY big fright! And so my big curiosity was satisfied. Oh, and we even saw one climb a tree. 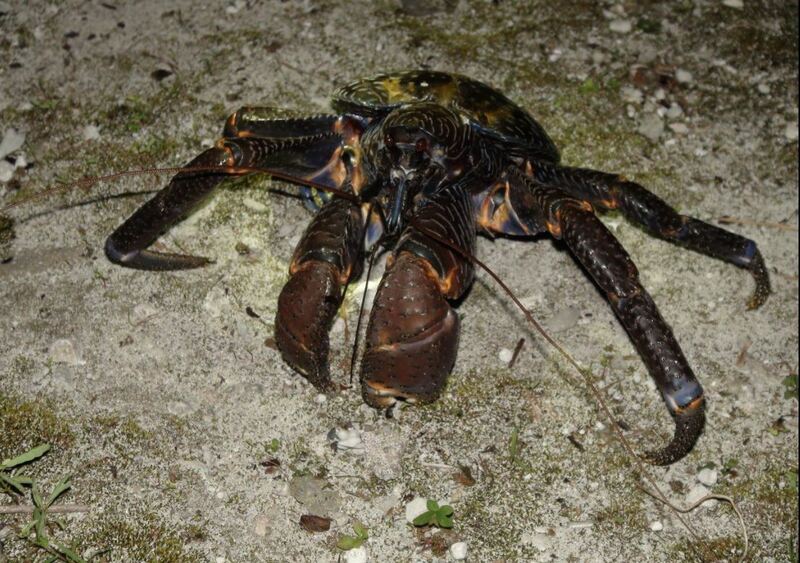 That concludes the Coconut Crab Adventure. It is not very exciting, but I hope you are at least awake enough to read this blog to the end. We didn’t just play in the sand and cry over school when out of the water for the whole time. 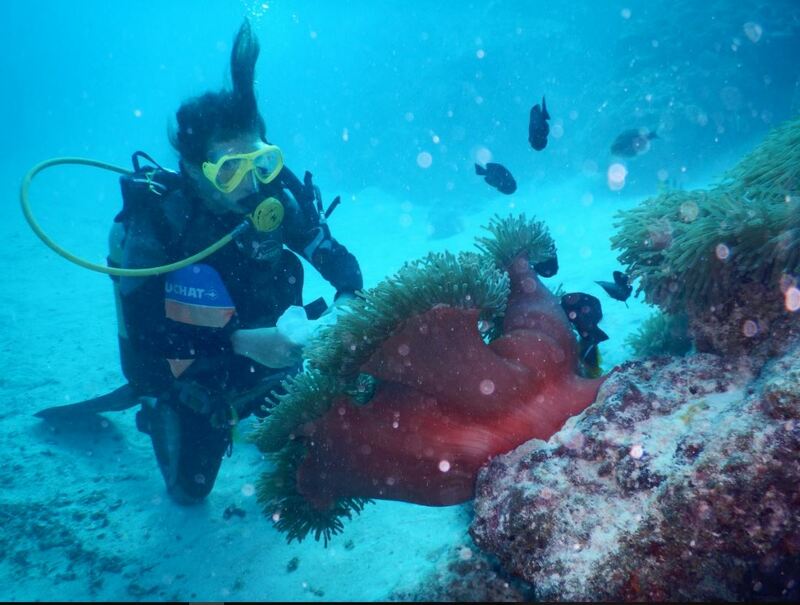 We also went diving to look at all the many amazing things God made and to become speechless because of it. 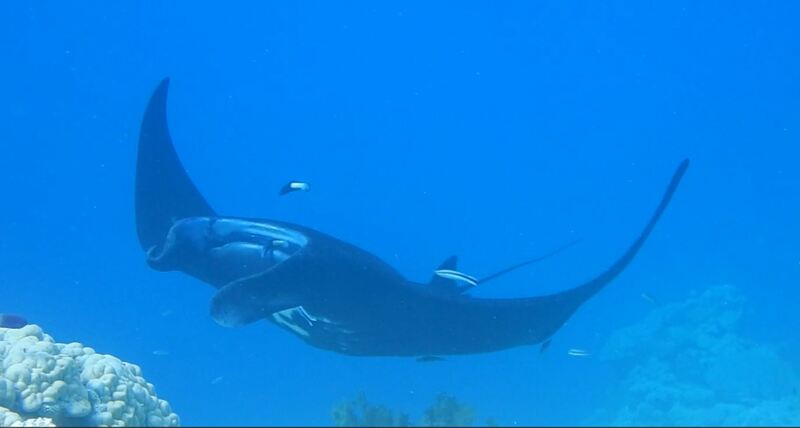 We were told that there was a Manta Ray cleaning station close by. 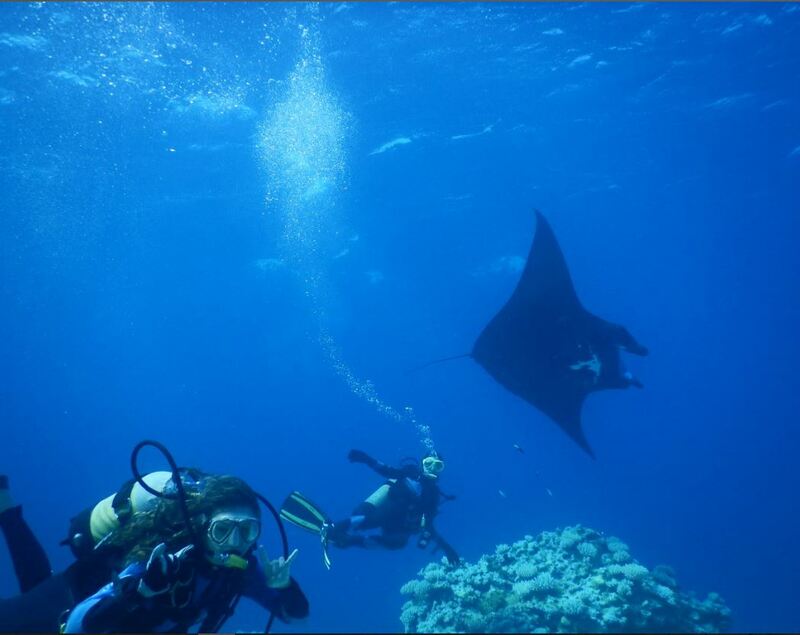 Now, we have tried to see some Mantas for a long time now, but never succeeded. We didn’t see them where people said you could find them because those places were feeding places and the water at feeding places are not very clear because …..guess what?.. they are full of food!!! (if you don’t know yet ,Mantas eat plankton and if you don’t know what plankton is then you can look it up. it is very interesting). 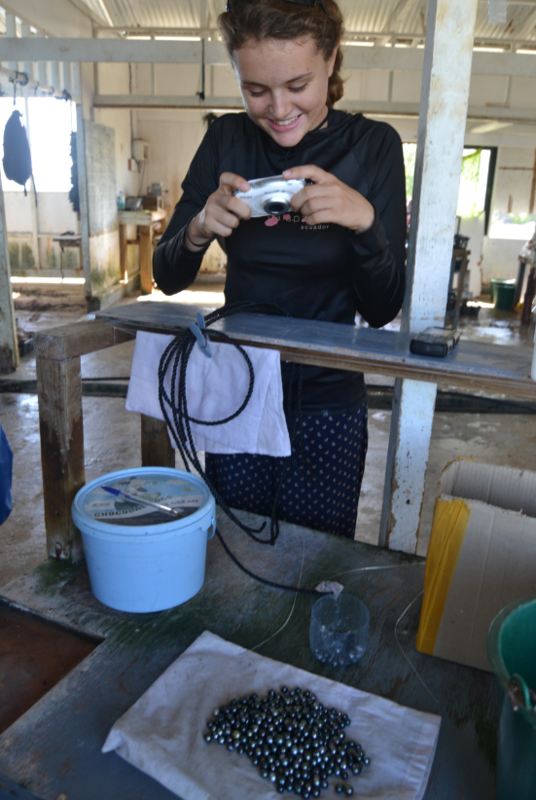 Anyway, we saw the Mantas and the cleaner fish that clean them. But they wouldn’t clean me, no matter how hard I tried to get them to do it. 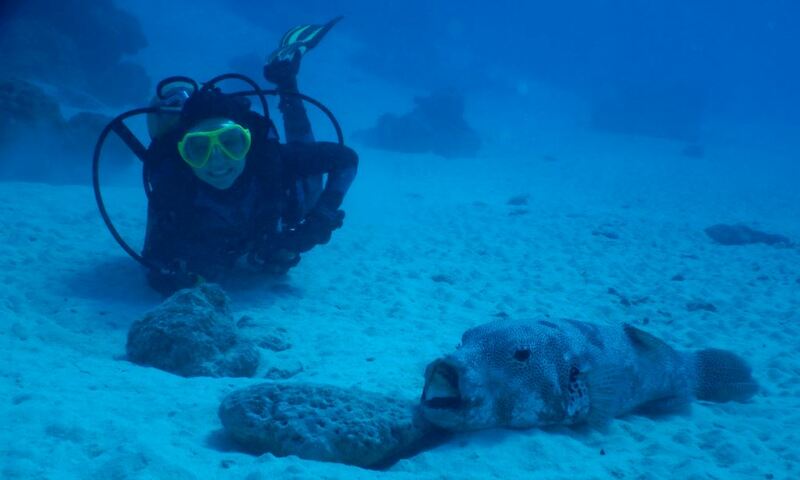 We all love diving, but Frans is the real force behind our diving adventures. He fights an ongoing battle against his withdrawal symptoms when we don’t dive enough. 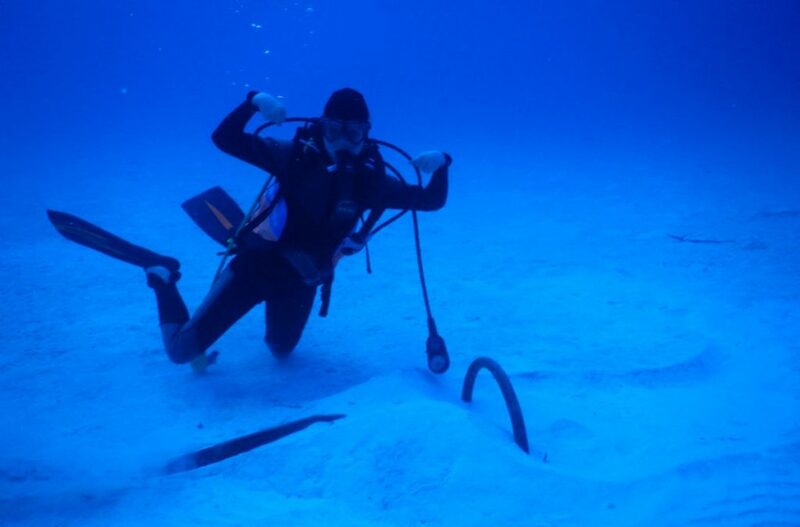 He was determined to do as many dives as possible at Bora-Bora. 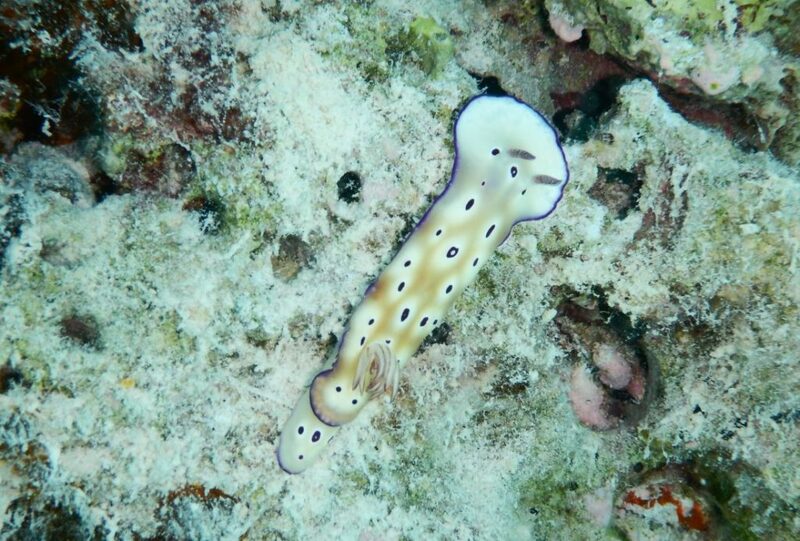 Even so, it took us a while to orient ourselves and find the “right” diving spots. 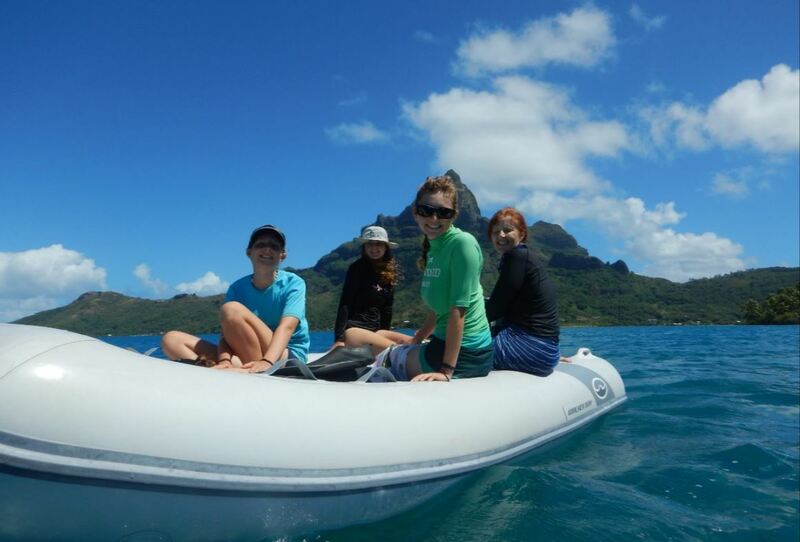 Our first search attempt included a very looooong and uncomfortable dingy ride that covered a vast distance. And where did we end up diving? Within sight of the anchored Shang Du! This is a “before diving” photo. Afterwards, the camera lense always has some waterdrops clinging to it. It was a good dive site and we came back to it a few times. 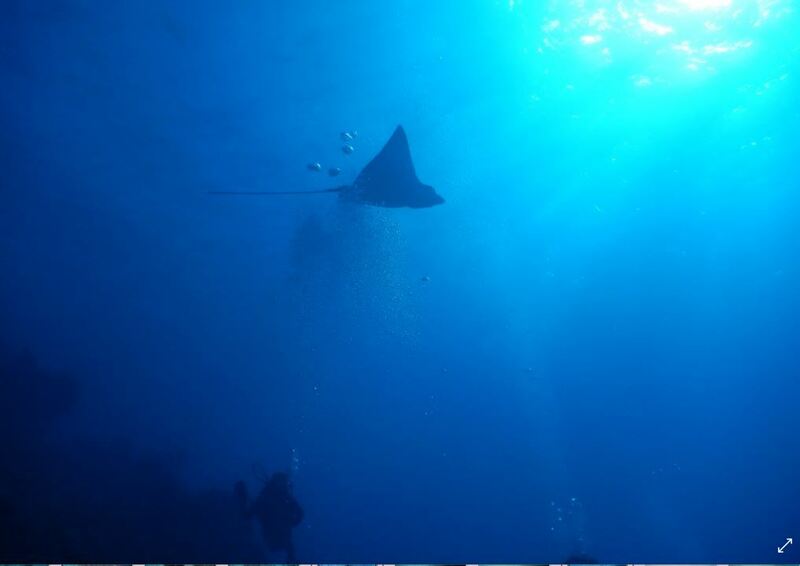 It is here that the Eagle Rays do their regular flying pass. They fly by in a large group with the slow up and down flapping of their “wings”. They make it seem so effortless while they move through the water, but just try to catch up with them! Their speed is deceptive and even their casual ballet leave us far behind. Just as you imagine that you are catching up to one, straining and panting with the effort, it gives an imperceptible flick of the body and disappears. 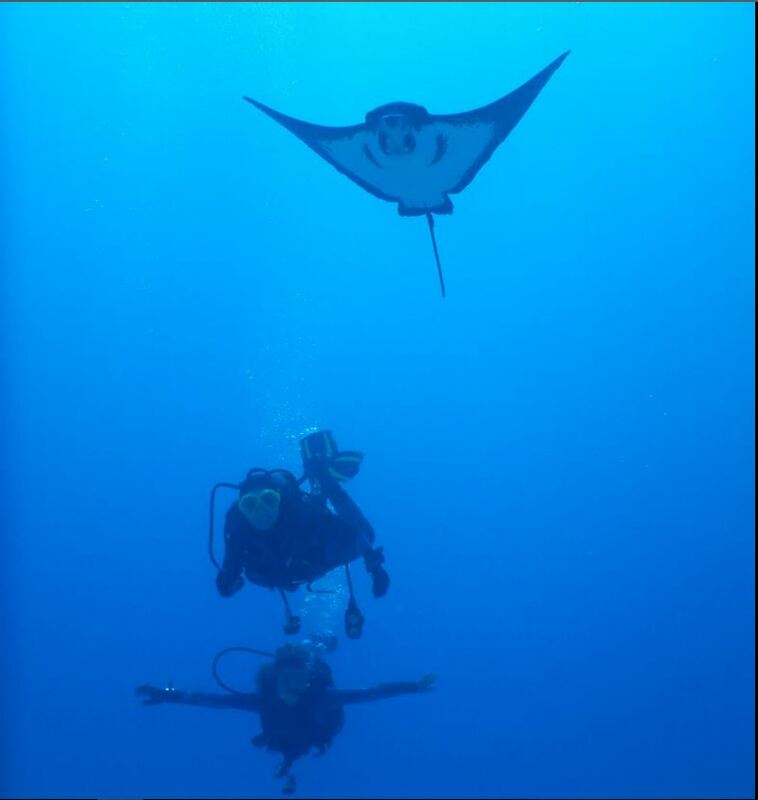 We never did find the elusive Manta Ray station and until proven otherwise, we are going to believe that someone mixed up their Eagle Rays and Mantas. 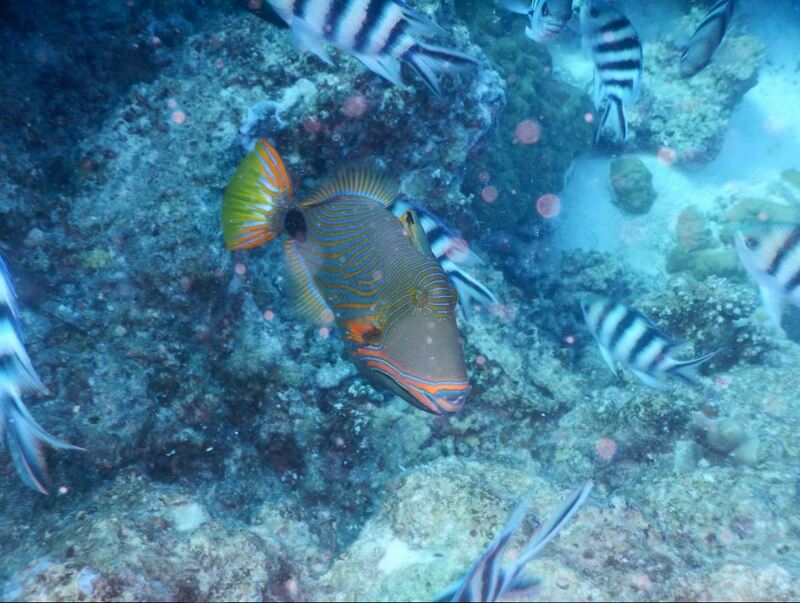 On our dives we saw many different types of fish. 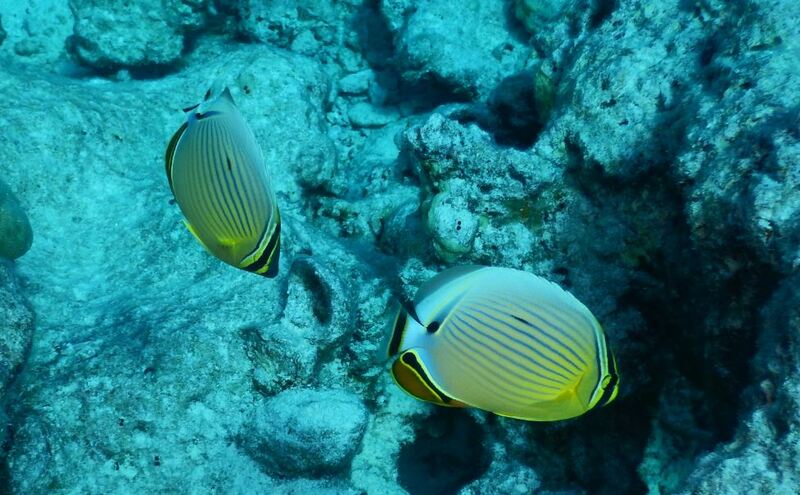 Angelfish, Butterflyfish, Surgeon fish etc. 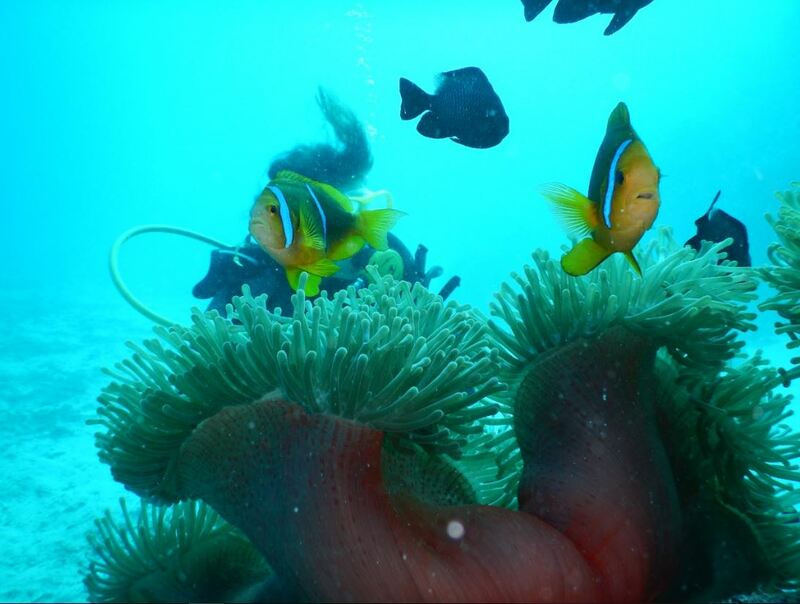 Also, for the first time in the Pacific, we encountered Anemones and Anemone fish. We love to hover in single spots and look for little things as well as the big things. 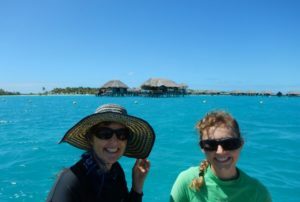 In Bora-Bora we were astounded to see how many groups of divers passed us, swimming fast and going places. 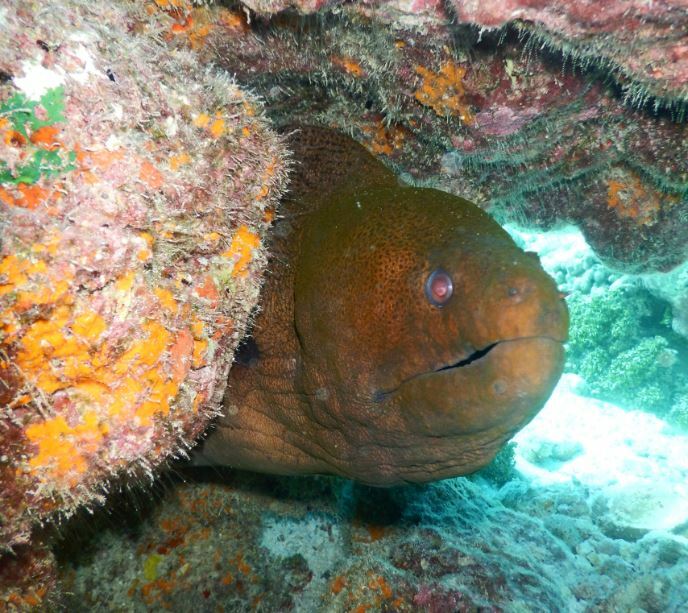 There are many dive operators using those reefs and we felt very grateful that we could set our own pace and watch the incredible sea life happen around us. We quickly realised that the fish here were used to being fed. As soon as we descended, many of them would swim right up to us to see what we brought. Not the usual fishy behaviour. So, the next time, we made sure that we took some cooked rice. You can see the result in the next photo: It was especially the Clown trigger fish that gobbled and gobbled and gobbled. 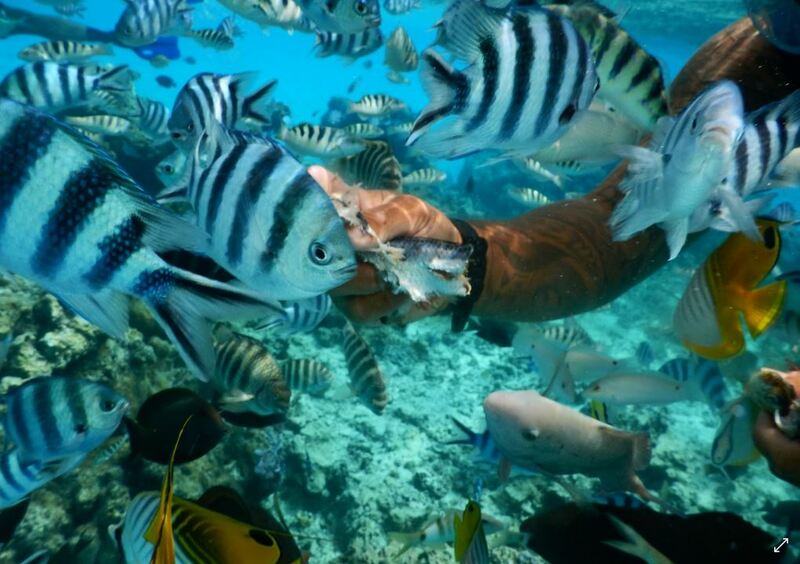 Snorkelling in Bora-Bora was nearly like diving too. 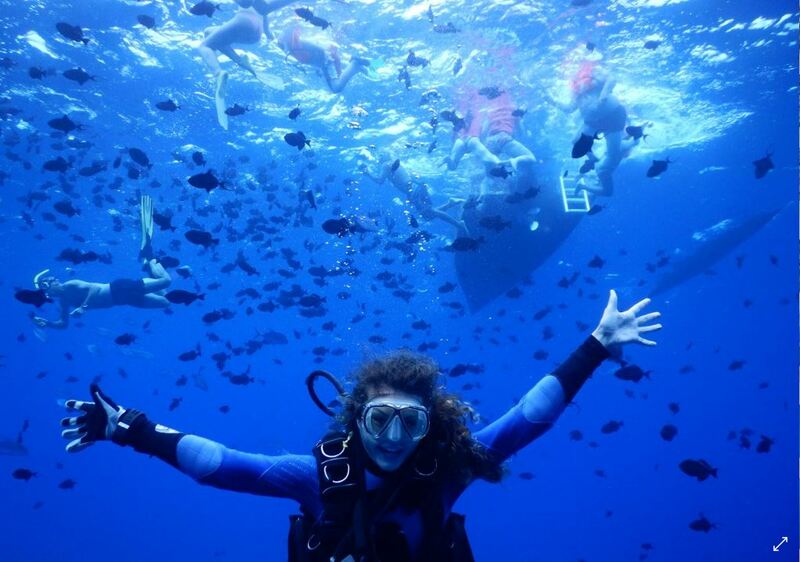 On our “round-the-island-with-dingy” trip, we stopped at a fabulous spot with many, many fishes. It was here that we saw that raw fish as bait is the real deal. 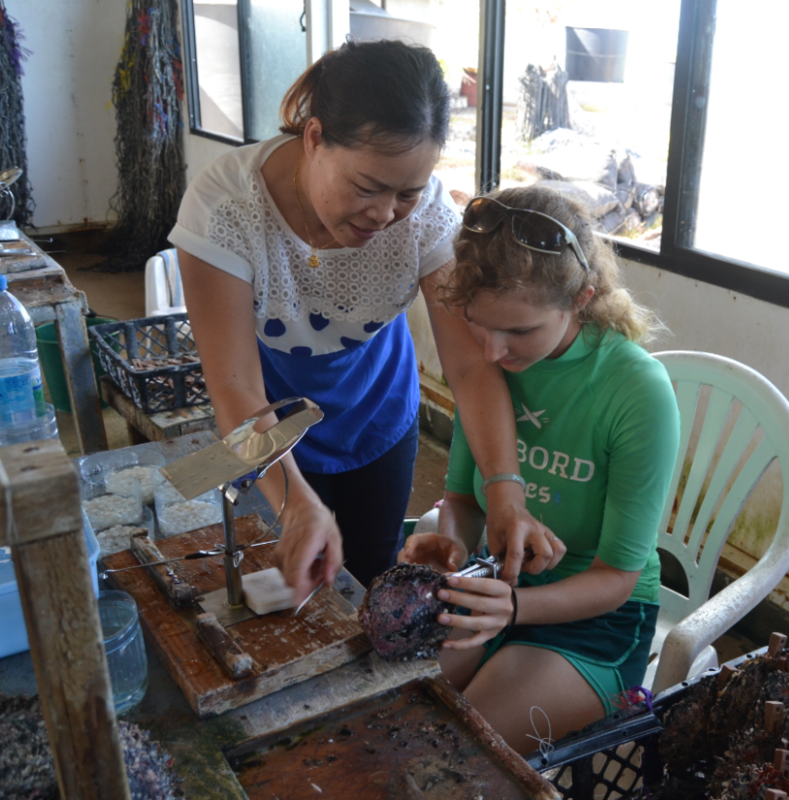 A resort diving instructor brought two snorkelers to that same spot and he was armed with a cache of small fish. He was really friendly and didn’t mind that we gate-crashed his feeding frenzy party. He even showed the girls a special starfish It seemed much too round to be one, yet nevertheless had the five tentacle pattern on the underside. 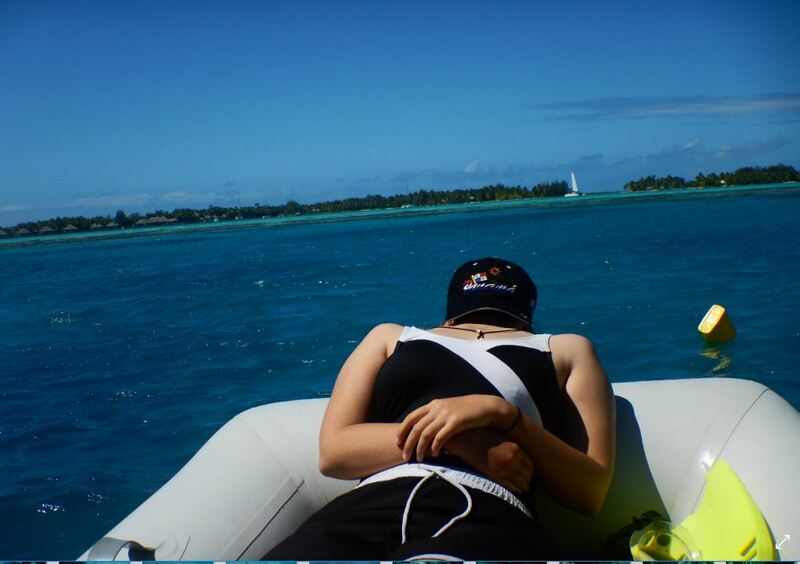 The downside of snorkelling is that the body cools down a lot faster and some of us just had to climb into the dingy for some heat. She might have lost her head there for a moment…… but no. If there ever IS a member of our family that might lose his head about diving, it will definitely be Frans – when he doesn’t get to do enough. 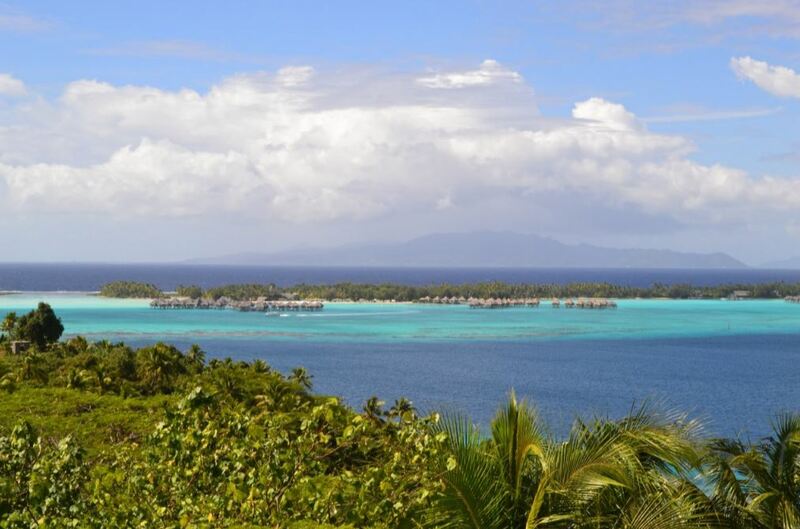 Bora-Bora is a Honeymoon destination par excellence. We, of course, were not on honeymoon. Approaching Bora-Bora from the sea, on your own little boat, just HAS to be VERY different from coming in to land on a jet-plane, staring starry-eyed at the beautiful island and enclosed lagoon. The news that friends of ours had run aground on a reef and lost their yacht was still uppermost in our thoughts and it made the surf, crashing onto the shallow reef surrounding the Bora-Bora lagoon, seem extra scary. We slowly plodded along outside the reef for what seemed like hours, before we reached the entrance. Every now and then we could glimpse the bright blue, CALM sea within. Oh, how we longed to be anchored. We anchored fairly close to town – rest and supplies being the immediate priorities. This would be our last port of call in French Polynesia. No clearing in, only clearing out once we were ready to leave. Aaaah……The first night after a crossing is always the best. Glorious, uninterrupted sleep. Bora-Bora must be a really famous place because even I have heard of it. We made a point of watching the movie “The South Pacific” after our stay there. Interesting. Not accurate, but quite recognisable. What we found on land was a bit disappointing. Frans and I visited the Tourist office, but even though the lady was really friendly, she gave us no voluntary information. She answered questions, but gave no suggestions and we ended up a bit more confused than before entering. We did manage to get a number for someone who offered Island tours. It was only later that we realised that almost all of the tourists on Bora-Bora fly in with a complete pre-booked package of what they are going to eat, drink, see and experience. And… if they wanted to add on to their experience, their “resort” would provide anything they needed. Very few people were “walk-ins” like us. 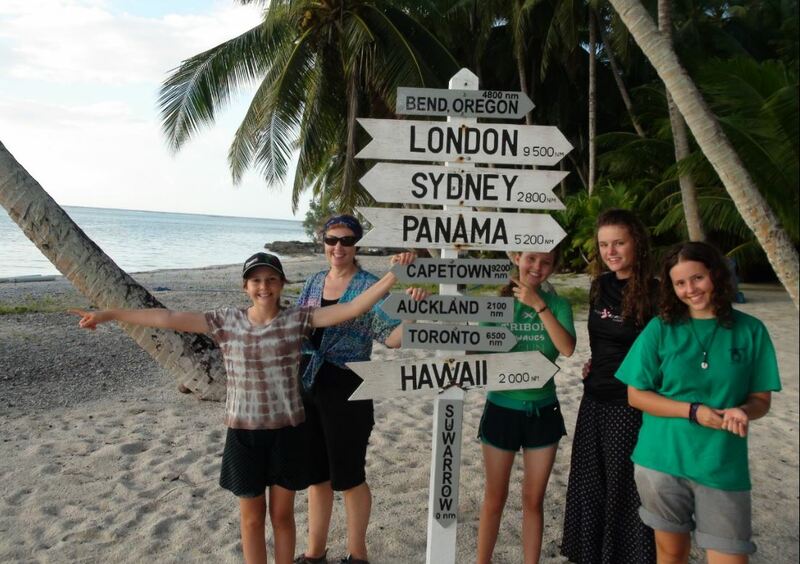 The great advantage of having a family of 6, is that any tour or service will probably run for us alone, as we invariably fulfil the minimum requirement. On our Island tour we were joined by a man and woman. As they introduced themselves to us, the children were tickled pink to AT LAST meet a real honeymooning couple! 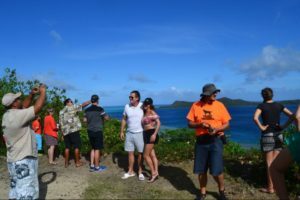 From them we learnt that it was really hard and also expensive to travel to the Island itself from the various resorts if it was not already included in your package deal. 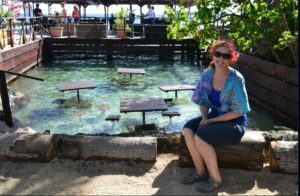 Most people are whisked away to their resort as soon as they land and then there is no way to get to the main island except by a ferry trip or special water-taxi – both very expensive! They also gave us some idea of what it felt like to stay in those idyllic-looking chalets with the glass bottoms and private little swimming pools that we could only glimpse from our dinghy. 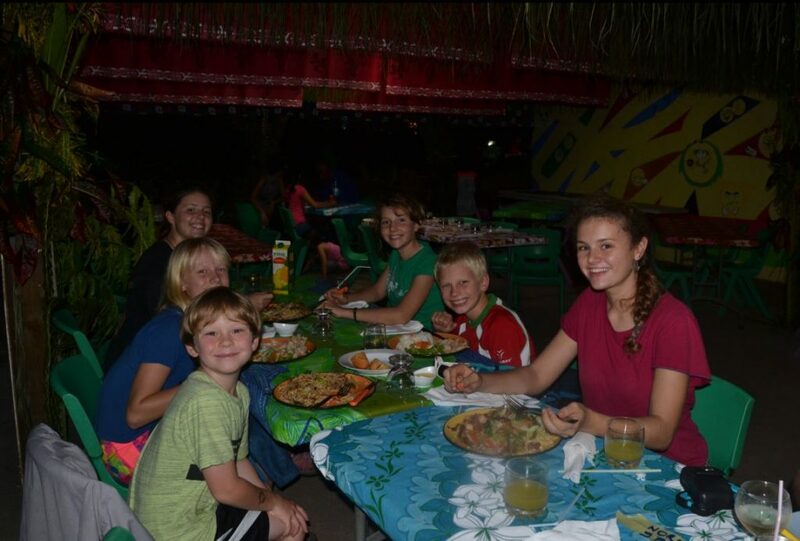 There are meals provided at the resort restaurant which are included in the package. Another plus. 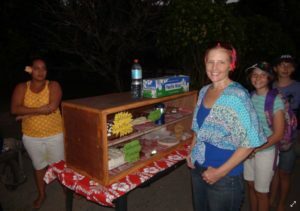 It made it very hard, though, for them to impulsively sample the streetfood sold at roadside stalls on the “mainland”. Apart from the little pool in front of each chalet, there is also private access to the sea. This seemed to be sooo cool, until we realised that there were no fish around the chalets and no reef nearby. This turned the sea into just another salt water swimming pool. The resorts do feed the fish at certain times though, and then it IS possible to see them through the glass bottom and also around the chalets. So…… why would one choose a chalet at a resort (stationary, not much sea-life, limited moblilty, captive market for expensive tour packages etc.) 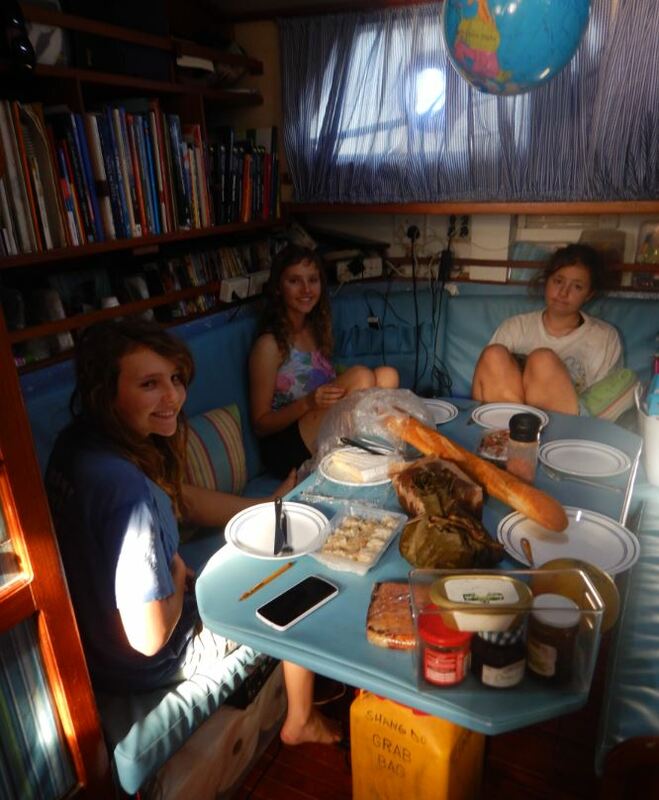 above your own sailing boat (with your own dingy transport, many changes of scenery, home-cooked meals etc.)?????? Even though the Tour operator was as friendly and his English even better than the other operators on previous islands, we had to come to the conclusion that he just didn’t have as much to work with on Bora-Bora. It really is quite a small island. He took us to 2 look-out points and three touristry attractions. 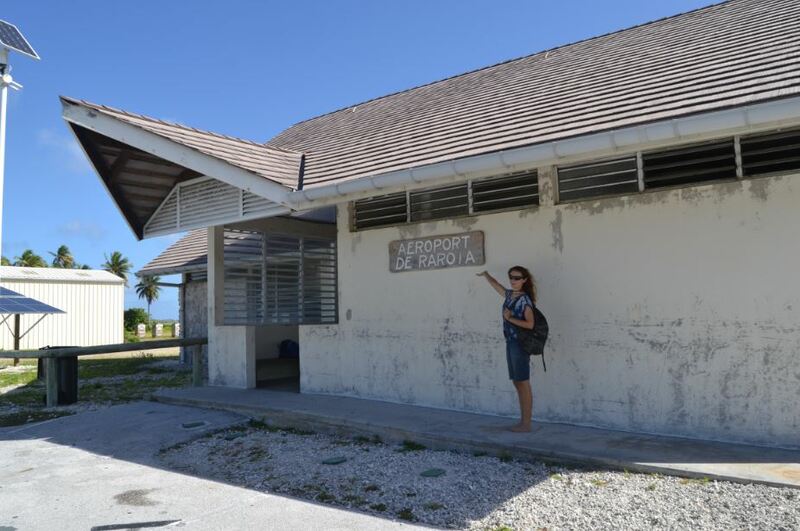 The first look-out point (or what Canadians call a Look off point) was next to the signal tower with a good view of the entrance canal into the lagoon. It was also next to the tour guide’s home. 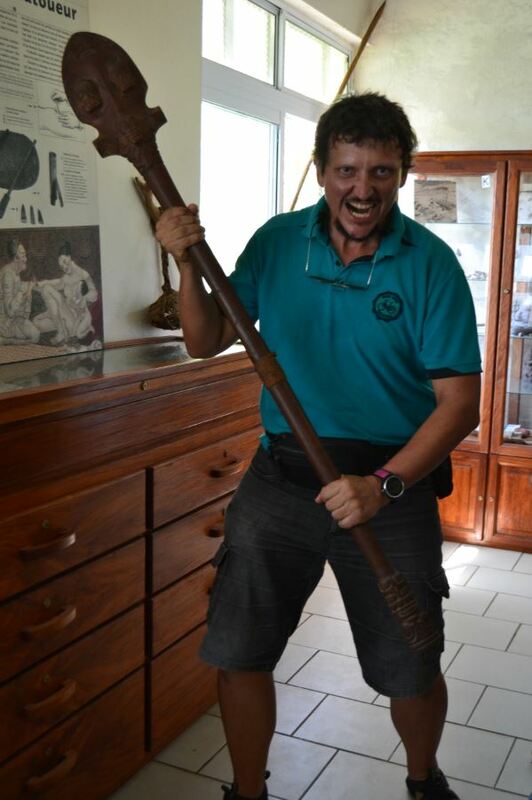 After a few questions, we learnt that he and his brother were some of the last people to be born on the island. 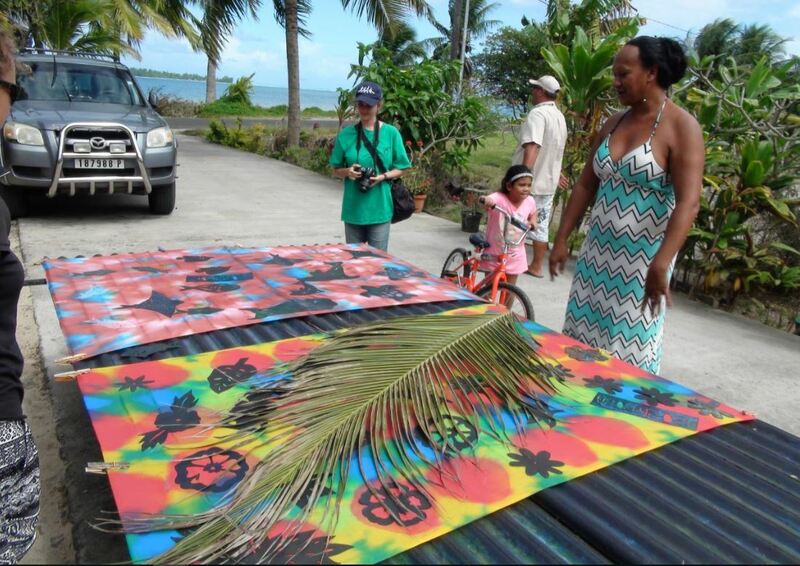 Pregnant mothers are now transported to a hospital on another island, to deliver their babies there. 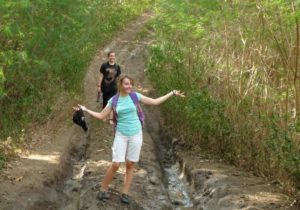 Some of the roads that we travelled by were DEEPLY rutted and we agreed that even if we had rented a car, we would not have reached some of the areas that we did. The other lookout point was a well known rock, slightly elevated from the sea. There is some story attached to it, I am sure, but our guide didn’t share anything in particular. We did have a good view of at least two of the “honeymoon” resorts. This is where we had our long discussion on what it was like to stay in those chalets. Our tour guide told us that the most expensive resort does not allow locals to dine in their restaurant. Ever. 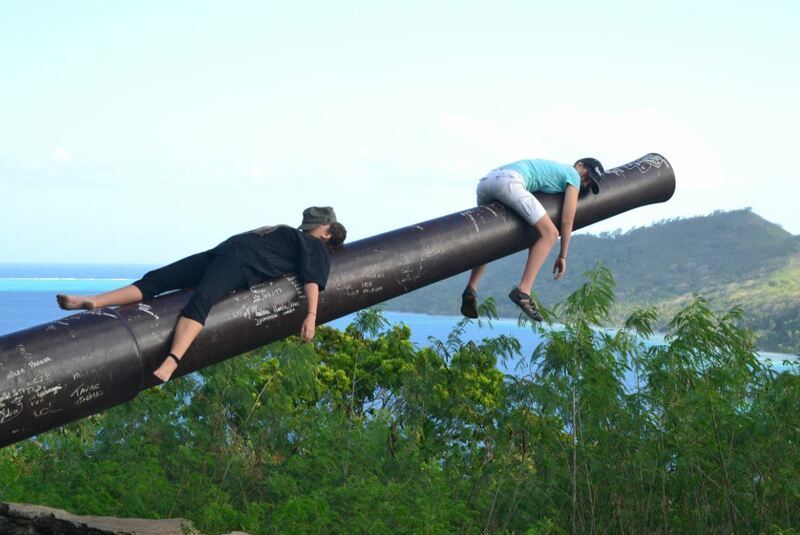 But, the tour did not only consist of lookouts. We were taken to three very touristry activities. 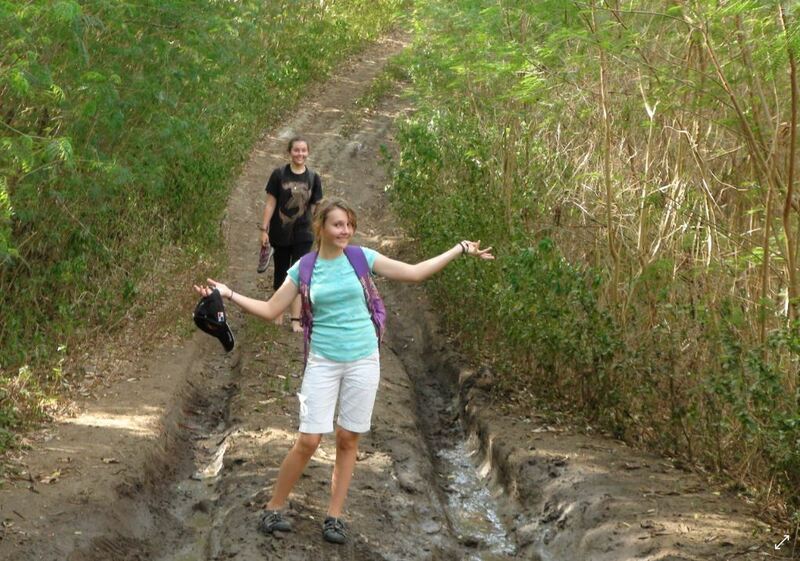 Touristry does not mean that it was not enjoyable, only that it was a planned activity put on just for visitors. 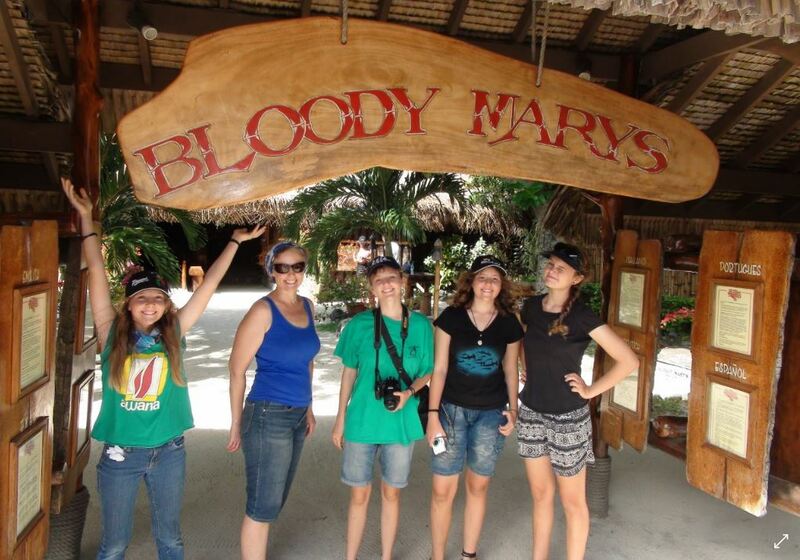 We visited a very well known pub/restaurant called Bloody Mary’s. In front of the pub there is a huge board filled with the names of all the celebrities that had visited there in the past. It was very amusing that some of the names that my children recognised were Rowan Atkinson and James Mitchener. Inside the pub, they have really unique restrooms. We would have missed these if it was not for my small bladder. The whole pub floor is covered in raked sand and they allow you to walk around barefooted if you so choose. Of course, Karin Joan so chose. The theme continues into the rest room with raked sand on those floors as well. There are swinging doors into the cubicles and it felt very beach-like . I could not figure out where to wash my hands. In one corner there is a “rock waterfall” with a little pool, but no water. The pool is at about hand basin height. After staring a little harder, I managed to spot the chain and ring hanging to one side. 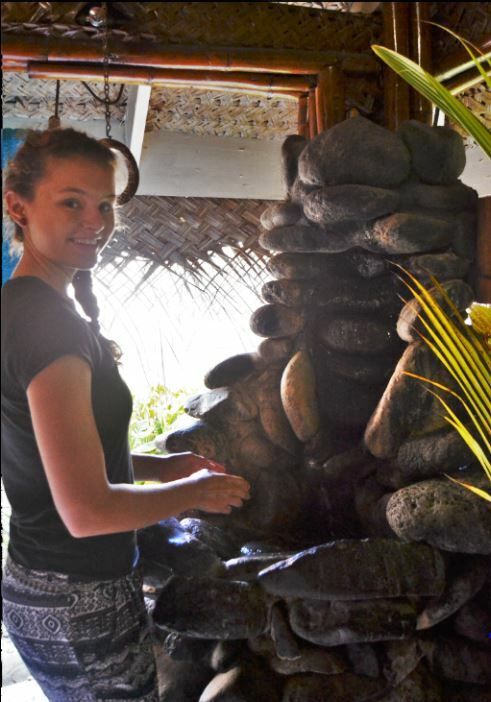 As soon as you pull the chain, you cause the waterfall to flow and you are able to wash your hands. 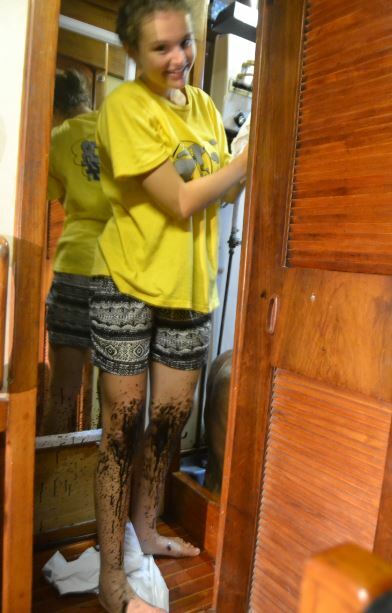 When I came out and shared my experience the whole Shang Du crew needed the restrooms. Frans said that the men’s ablutions were even more interesting, but we won’t be posting a picture of that. 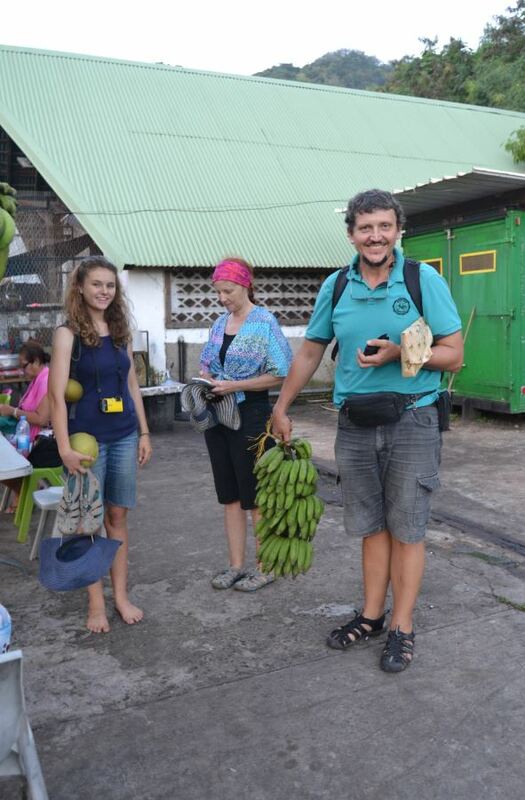 The second “activity” that we visited was an introduction to the island fruit. We loooove fruit. 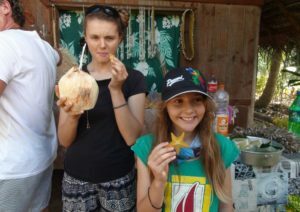 The huge “Pampelmoes” (grapefruit) and the coconuts went down very well, but we were a bit wary of the starfruits. They are beautiful when cut up and a great garnish to any dish. 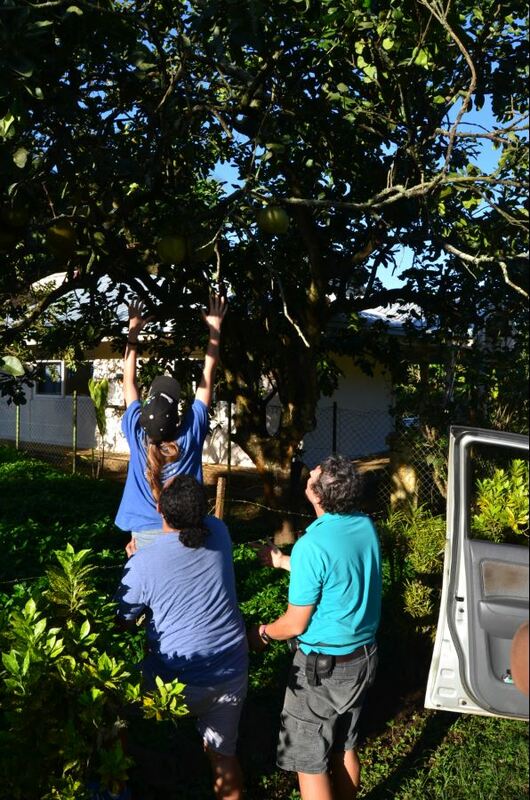 Our first taste of starfruit was in Brazil and we decided then that these were an acquired taste and that we had not acquired the taste. 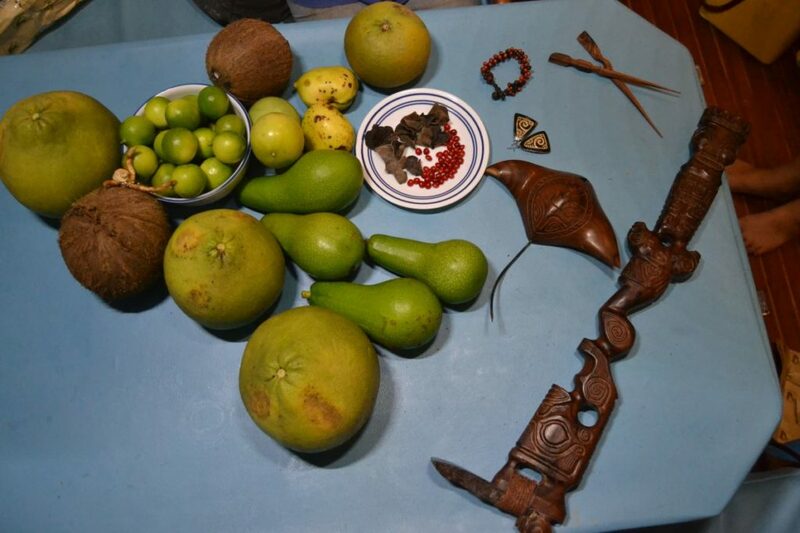 But, true to the island people’s nature, they insisted that we try them, and I must admit that this was a very different fruit to the Brazilian one. They looked the same, but tasted much nicer. It was nearly two and a half years ago that we were in Rio, so maybe we have just changed in our expectations, but I think not. Our last stop for the day was a cloth printing shop. They use paint, sunlight and stencils to produce all kinds of beautiful handprinted materials. Of course, they also want to sell the merchandise that they make. To assist in their sales, we had an extensive “sarong parade” in which they demonstrated the diversity of the sarong by draping it over us in many ways. The “woman” in charge was actually a man (Behind Marike on the photo). “She” was definitely trying to look like a woman and it was very funny, but the only ones in our tour group to be taken in, were the two men! 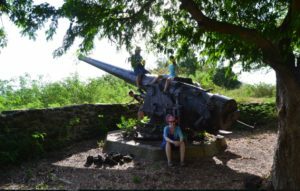 We did enjoy the tour, but in retrospect, we think the operator could have done a much better job if he divulged more island stories and explained Bora-Bora’s involvement in the War. 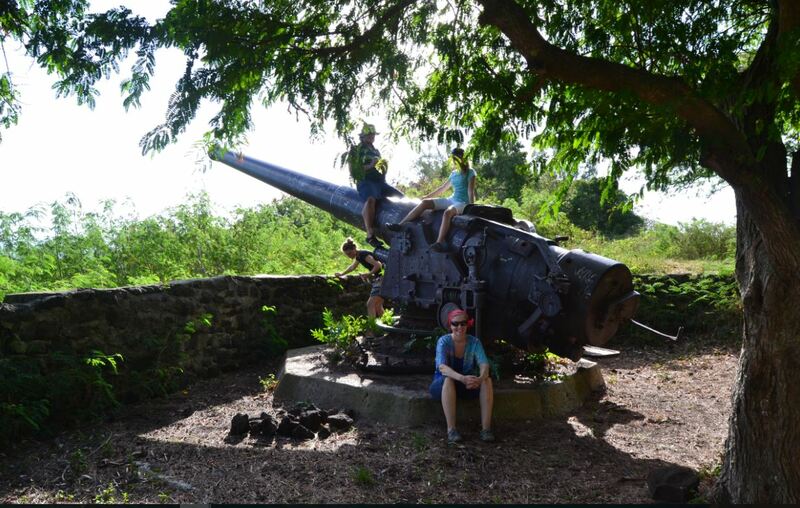 Later, we did some exploring on our own and managed to find some of the war cannons still up on the gun turrets. It was a lovely walk – even though we had to ask for directions twice, as it was so badly marked. The first time was at the yacht club (where rich yachties go to relax). On the way back, we actually stopped there for some VERY expensive coffee and milkshakes). I have to say, that I don’t know which treat was nicest. The one from the Yacht club, or the one we bought from a little roadside stall after another walk. Probably the second, as it was such a “local” thing to do. The lady selling from this roadstall had her child there as well. Bathed and in his pajamas, ready for bed. What a lovely setting to enjoy our streetfood in. 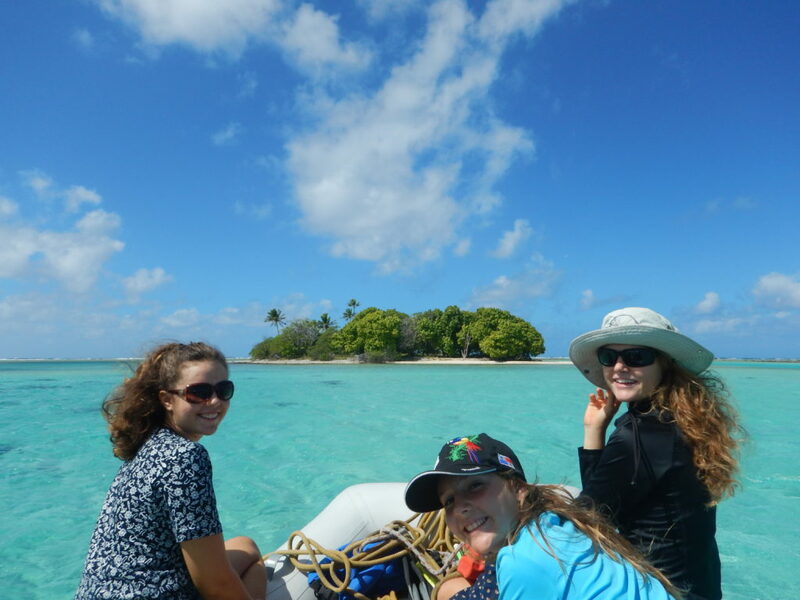 The other activity we managed to do was to take our dingy right round the main island, on the inside of the reef. It made for a great sight-seeing trip even though we became thoroughly drenched by a sudden Tropical downpour. Then, there was the real reason for going to Bora-Bora. The diving! I was going to include the diving into this blog, but it is long enough as it is. You’ll just have to watch this space for the underwater section. Coming soon! 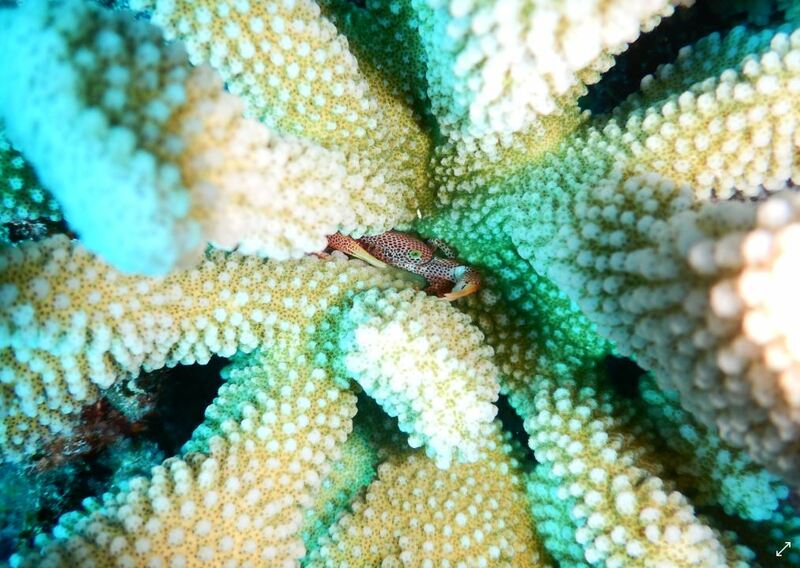 The thing that is both the beauty and danger of coral atolls is, well the coral. The inside of the coral rings are speckled by countless ‘bommies’ of coral rising up from the bottom to sit just under the water’s surface. If the light hits the water at the wrong angle, such ‘bommies’ are completely hidden and very easy to run into – thus a sharp lookout must always be held, no matter how good or up to date your charts are (or claim to be). Actually getting into an atoll can also be quite tricky. Atolls very often have only one or two small passages through the coral into the lagoon, used by boats to enter and leave. This means that the vast amount of water inside the huge coral ring also only has those one or two passages to enter or leave by, resulting in powerful tidal currents up to more than 8 knots strong. The fastest Shang Du‘s engine can take us is 5 knots… So we tried never, ever to be against the current. However, even going along with the current has its do’s and don’ts; it took us a few trials and errors to figure those out and, eh… just don’t go repeating some of these things, okay? 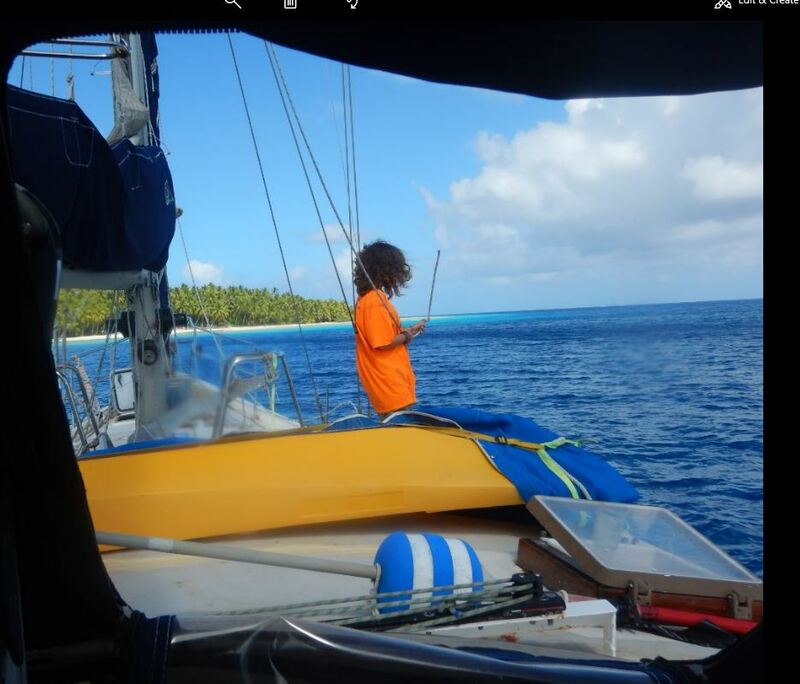 When we entered the Raroia atoll (our first atoll) everything went smoothly and we anchored safely. 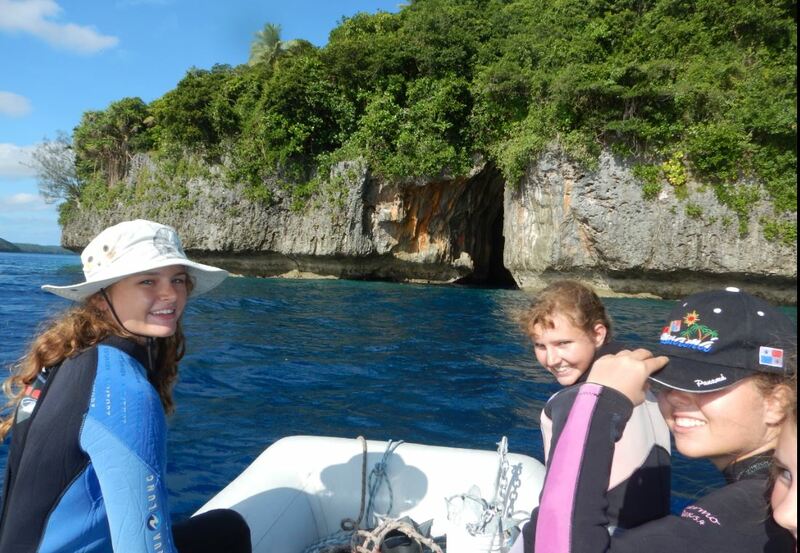 We were all excited to do our first drift dive through the passage since these dives are said to be quite spectacular. 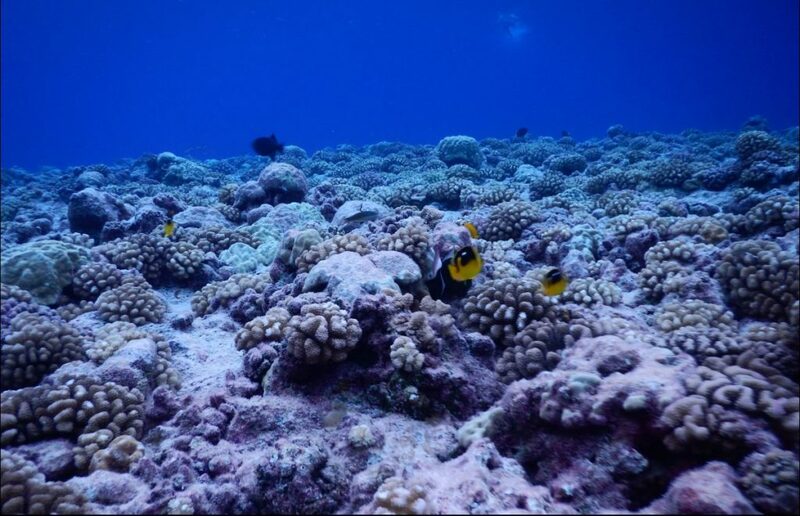 This is because the coral outside the passage is more abundant and vivid than the coral inside the atoll. 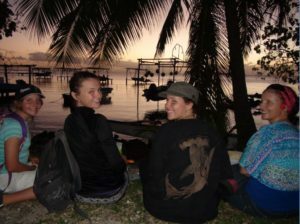 We especially got up at 5 a.m. to get ourselves and our gear ready for the next turn of the tide. We choose the turn of the tide because that is when there is no or just weak current. The idea was that we would descend outside the atoll and drift dive slowly through the passage into the lagoon while someone holds onto the dingy rope. Then we would all get back on board our dinghy and go home. It worked a little differently in the end, though. First of all, we made the mistake of going down in the middle of the passage mouth and not more to the side where any current would be weaker and also of having only our Dad hold onto the dinghy rope. It was a rather tense 26 minutes under the water, half of which I didn’t quite understand what was happening. 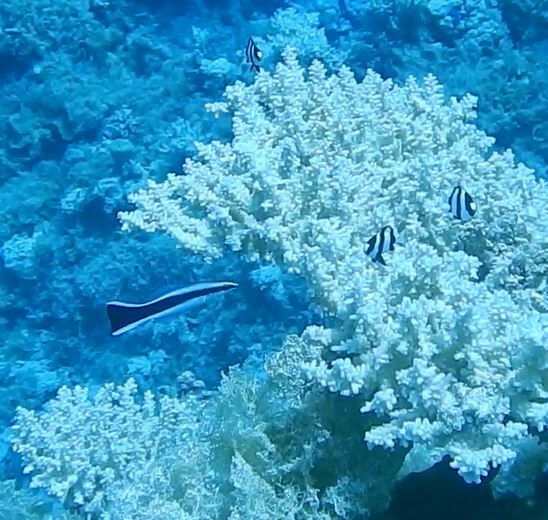 As we were descending to the bottom of the passage we were in awe of the many new, bright and enchanting fish and coral that greeted our eyes. We started our usual diving routine of more-or-less sticking with the other divers while basically doing our own thing. However, the water at the surface, where Handy Andy (our dinghy) was, was flowing faster than the current where we were. The result was that my Dad got pulled along a lot faster than the rest of us because he was holding onto Andy‘s rope. By the time we all fully realized this fact, my Dad had already been dragged practically out of sight. Marike managed to join him and I was well on my way, swimming as hard as I could, when I looked back and realized the others were not managing to catch up. I was at a loss as what to do, not wishing to leave the others behind, but not knowing how to help them catch up. 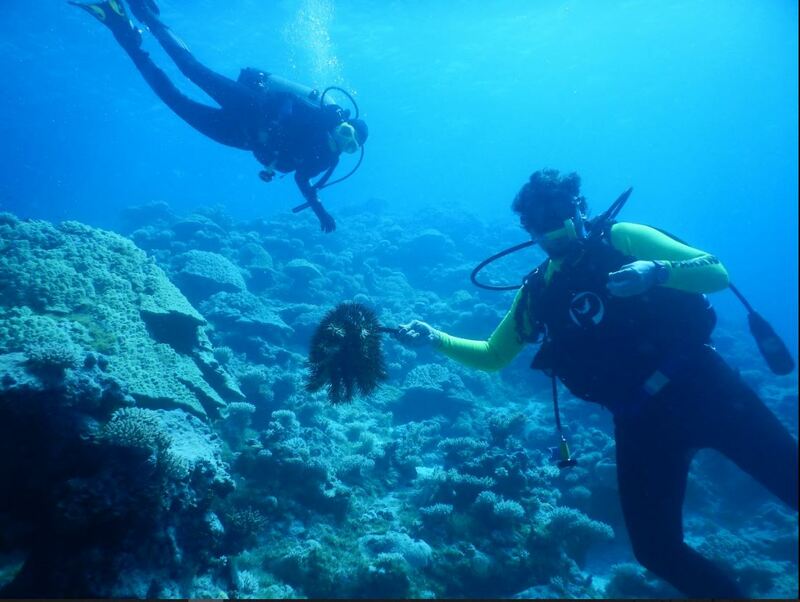 Luckily Marike then swam back from Andy to where I was and held onto some dead coral, signalling for me to do the same. My Dad disappeared behind the curtains of water and the other 3 family members slowly joined us and clung to the coral. When we were all together we held hands each other and ascended . At the surface things didn’t seem quite so scary or confusing and we spotted Handy Andy not far away and easily reached it, just as my Dad got on. Needless to say, that wasn’t an adventure we wished to repeat. The next time we did a passage dive (and every time after that), we dropped at a point to the side of the passage so that we actually needed to swim a nice little while before entering the passage and the current. We also had an extra-long rope attached to the dinghy and we all held onto it; it made going through the passage quite fun, because once you were in the current it was a rocket ride to the other side, with only a split second to admire (bewonder) any coral or fish that might catch your eye. The next adventure we had that involved corals and the passage currents was when our engine refused to start as we tried leaving Raroia. 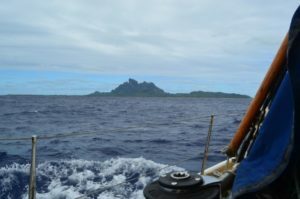 After my Dad tried everything he could to get the engine going, we had to make a choice: We could either stay at Raroia for the night and try to work on the engine again the next day, or we could try to sail out of the atoll and onto the next one, Makemo. It has a bigger village and therefore hopefully also a mechanic. 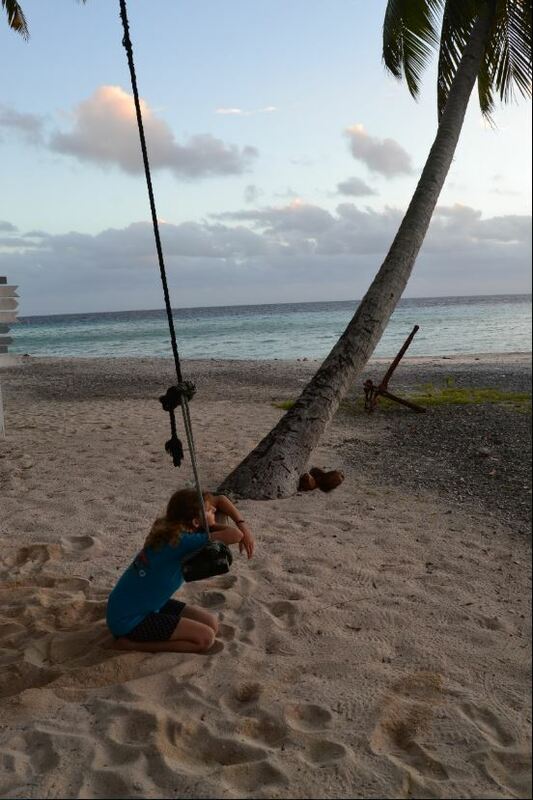 The problems with the second option were that we would have to pull up our anchor under sail, and since we were anchored all the way at the other side of the atoll from the passage, we would have to cross the whole lagoon with all its hidden bommies. We had a nice dotted line on our GPS Chartplotter showing where we had safely crossed before, so we just stayed on that to avoid the bommies. But with the restriction in manoeuvrability it was still stressful. It was already latish when we decided to make the decision to sail and as we sailed across the atoll, the wind, which never had much will to begin with, slowly sank lower and lower so that in the end it took us 2+ hours to travel just over 5 miles. As we got closer to the passage the little land there was, managed to systematically cut off more and more of this precious resource. When we had almost entered the current, it started sucking us in and the wind left us completely. Do you know what white water rafting looks like? Well, being spit out of the atoll by the current felt something like that. We had no wind, so we had no way (i.e. forward momentum), and no way equals no steering. Also, when the currents are strongest, quite enormous standing waves can form, like those in a river, and we flowed over these pretty much like any floating object without steering would. First sideways over this standing wave, then a 180 degree turn to go sideways over that wave. . . It couldn’t have been more than 3 minutes, but the white foam all around us and the roaring were quite frightening, so I just ducked down the hatch and hid inside the boat till it was over. Waves are one of the things that actually really scare me. Once we had been carried outside the atoll the breeze found us again. 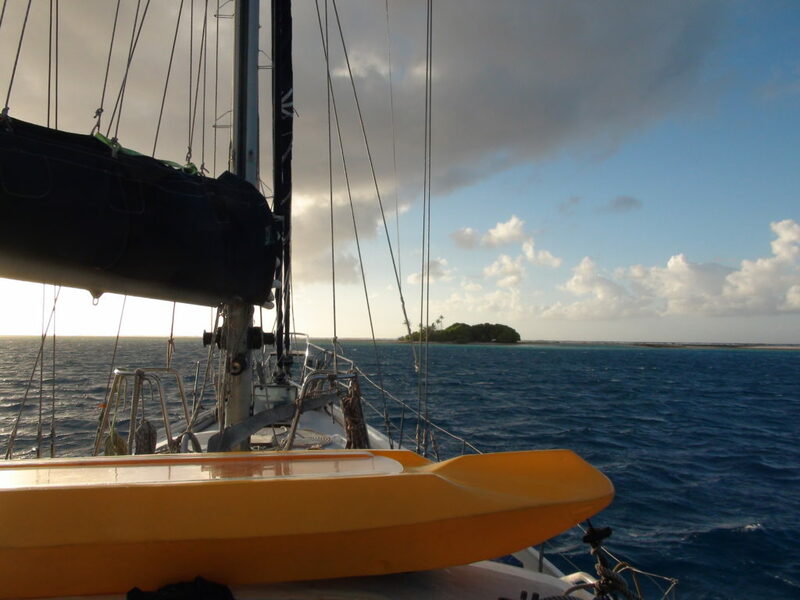 There was a scary moment where it looked like an eddy in the current was pulling us back toward the coral island so as to strand us, but the sails were quickly raised and a few moments later we had enough way to completely escape the current’s grasp and sail away. We were very relieved and thankful for God’s protection and provision. By that time the sun was under with only a few of its rays lingering, so we all settled into our usual night-watch routine for the night. The next day we reached Makemo at around nine. This time we had a proper battle plan for tackling the passage without our engine. The sea wasn’t rough and it looked like the current wasn’t strong because there were no standing waves. We had Handy Andy tide to the side of Shang Du so that it could provide push and way, but still let Shang Du be in control of the steering. We also had our forward jib up (it’s a sail that we can control from the cockpit). We were coming at the passage entrance from an angle and had to turn to enter. I’m not entirely sure why – maybe it had to do with the land distorting the wind again – but once we had turned to enter the passage the wind came from a different angle than we had expected. The jib, instead of helping us, backed (i.e got blown in the opposite direction it was supposed to) and actually killed all of Shang Du’s ‘way’ and then started pulling us toward the side of the passage where we could see the crystal clear sea breaking over beautiful coral. Not a fun moment. Then came a problem we hadn’t thought of. As long as Shang Du had enough way she could steer a straight course, even though the dinghy at her side was pushing her sideways. With no ‘way’, the dinghy pushing at her side meant she could only turn sideways until enough momentum had been built up. There were only a few moments between almost being stranded on coral, quickly rolling in the sail, and discovering this problem. While we were still in the passage mouth we tried to turn Shang Du around so that we could get away from the passage to catch our breath before trying to enter again. However, God, in His sovereignty, determined otherwise. We arrived as the current was flowing into the atoll surprisingly strong. It completely ignored both Handy Andy’s best efforts and the tense commotion on board, and quietly but surely pulled us through the rather long passage – backwards. My Dad, Mom and Marike were quite tensed up and were trying all sorts of ways to get the boat to start going forward again. We couldn’t turn the boat around, because there wasn’t enough room in the passage for any such manoeuvring. I know we were all praying and also that God kept me peaceful. I was watching the metre+ gap between Shang Du and the reef we were gliding besides with interest; we weren’t being pushed onto the reef, but we might scrape along it for a while. I was also keeping an eye on the last channel marker, trying to think of the best way to shove buoys between us and it. We didn’t need to in the end, but only just. The water was so pristinely clear. 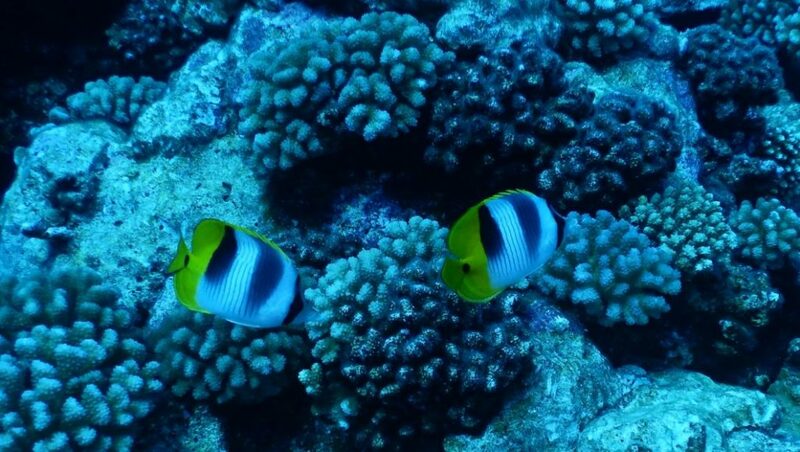 It and the reef seemed calmly unaware of the tense commotion of the boat beside it. 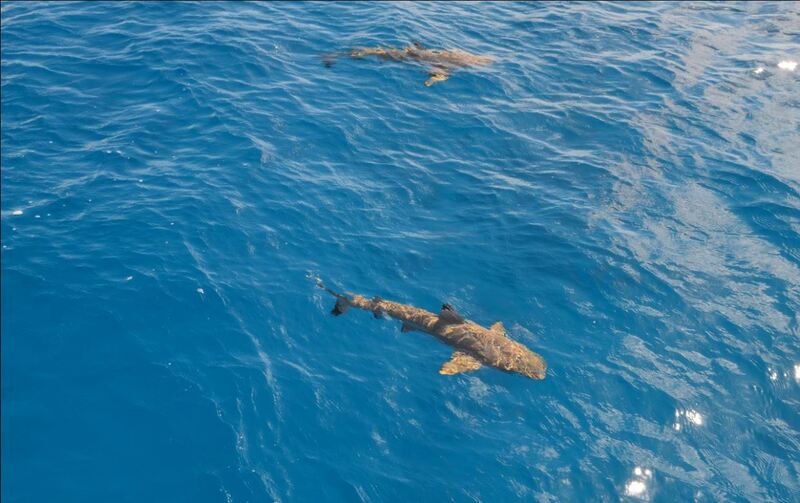 Little Black-Tip Reef Sharks were gliding peacefully over the top of the reef, the water so shallow that the tops of their dorsal fins stuck above the water like little flags. We drifted safely into the lagoon and then my Dad could finally calm down again. Here there was enough manoeuvring space, and we used Handy Andy power to pull us to a safe anchor spot next to the village. God was so gracious to us through this whole episode. Not least with providing a mechanic for our engine. Our parents went to shore soon after we anchored and almost immediately came back with a mechanic. They’d gone to shore, met a very friendly French sailing couple who gave them the name of a guy who could help. With the Frenchman interpreting, my Dad asked for help and the guy and his assistant came immediately, despite the fact that it was Friday. They worked right through the weekend till our engine was fixed. It was quite funny how things worked, because each new piece of information or problem was discussed in four languages: In Polynesian Maori between Abel and Tamatoa (mechanic and helper), then told in French to the other yachty, then he would translate it into English, and then we would discuss it in Afrikaans ; D.
When the engine failed to start in Raroia we had thought we recognised the symptoms of having salt water in our engine (it syphons back through the sea water outlet and then floods the engine). When the mechanic came, our fears were confirmed. In this too, God greatly provided for us. 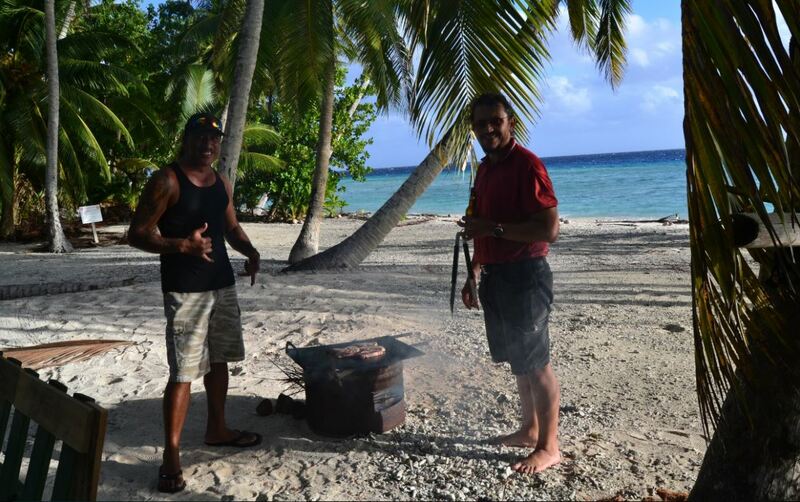 If we had sailed to a larger island where we would be sure to find a mechanic, like Tahiti, it would have taken longer and our engine would have been all rusted up and unusable and unfixable by then. Every atoll has one or more passes, as explained in my last blog that was about what an atoll is. But for those of you who are still unenlightened, I will put in a better effort since my previous description wasn’t very good. An atoll is a island that got pushed up by a volcano long ago. The island however, started sinking slowly, but take into account that the sinking was a slow process. So, although the difference might be visible every year, it’s still not major. While the island stands tall and elegant, coral and likeminded animals grow on its edges, forming a sort of a fringe, you could say. When the island sinks, the little coral fringe doesn’t. It stays behind. 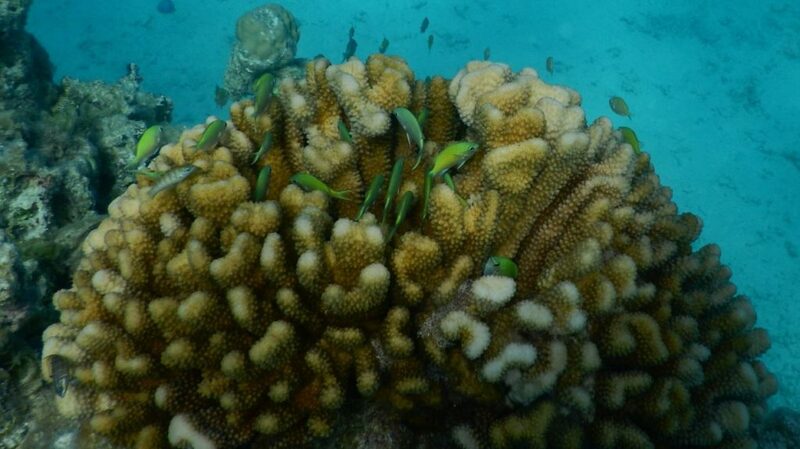 So gradually, as the island sinks away through the decades, a coral barrier surrounds it. This forms a sort of lagoon area between the island and the open ocean. The coral fringe isn’t equal all around the island, so in some places it might actually stick out of the water, while some other places might only feel the wind’s kiss at low tide and so on. Over time these higher bits pick up bird poo and coconut husks which form dirt for coconut trees to grow on, which form more of a basis for more dirt to get stuck and so on. I’m not sure about the details, so don’t quote me on this when talking to a person who knows all about it. To someone that knows nothing about it you would sound smart but to an educated student of atolls you’ll sound terribly lost on the road of knowledge. Anyway, this is what I understood of it and I must have at least a correct idea of the thing, otherwise my siblings, who were paying attention, won’t let me post this. So eventually, when the island is all under the water again, the coral fringe still remains where it was. But now, at some places, the shallower part of the coral fringe has formed little thin islands. Thus the finished product of the atoll is a ring of little thin islands with some breaks in-between them. What happens to the coral fringe that doesn’t stick out of the water and become island? It stays under the water as far as I can tell, but it’s often not very deep, or at least not deep enough, for say, Shang Du to pass through. So, some atolls aren’t populated or ever get visited because the sea is constantly breaking on it from the outside and there’s no pass through which to get inside. Some atolls however, have had their passes deepened so that larger vessels can travel through to the inside. Another, and very important, detail of the atolls, are the tides. Now in the middle of the ocean it doesn’t really matter what the tide is doing, right? Well, I never really thought about it, but the tides are still there and that becomes apparent in the atolls. Because when the water level lowers, the water inside the atoll flows out, causing strong tides flowing out of the passes. And then vice versa, when it’s the other way around. So, when going through the passes it’s very important to know which way the current is going and to plan accordingly as it is quite hard to go against the tide. Having explained all that, I will now proceed to the story. In Raroia, there was only one pass that was deep enough for us to use. The Kon-Tiki island I told you about in my last blog, was on the opposite side of the atoll. What we did was go into the atoll and sail all the way to the back. I must also mention that in the middle of these atolls there are lots of coral heads that don’t quite stick out of the water but that are very shallow. Its fascinating to think that maybe they were once the tips of mountains. But who knows? Anyway, they’re called bommies by all the sailors we’ve met and presumably everyone else who knows they exists except maybe some scientists who obviously use the scientific name. These bommies are quite dangerous and stealthy. At certain times of day it’s almost impossible to see them but even when the lighter patches of water is visible you still often need to keep a vigilant watch for them. Despite these obstacles, we managed to get to the other side safely. But when we wanted to leave again, the engine wouldn’t start, we tried everything. In the end it was starting to get late, the sun was getting closer and closer to the horizon. Time was running out. To my disbelief Dad decided that we needed to leave anyway. The wind was blowing in a favourable direction and we could still make it through the pass before sunset and with an outbound tide. So we were off. We sailed across the atoll, my Dad filled with stress at not having full control of the boat to better avoid bommies and avoid beaching or something. “At least we have a steel boat.” This is a comforting line we use often when doing something risky like this. God was with us, and we didn’t beach. We reached the other side in time for it all, but it was wind over waves. Which means that the wind was blowing one way, and the current is going the opposite way. When this happens, the waves tend to get larger than they would in normal circumstances. They also tend to be unpredictable and confusing. The wind lessened as we approached the pass because of the land blocking it. This made us lose the little control we had of the boat. We were now completely in God’s hands. Where we belong. It was getting harder to see now and everything became more like dark moving silhouettes as the sun moved further beyond the horizon . I wasn’t in the cockpit at the time, but I’ve got a pretty good idea as to what it was like. Almost as if small mountains had a little fun by pushing us around, coming up from below to surprise us as we tried to dodge them. But thanks to God we made it through safe and sound, bound for our next destination and the real subject of the story. The entry into Makemo. So we had two choices. 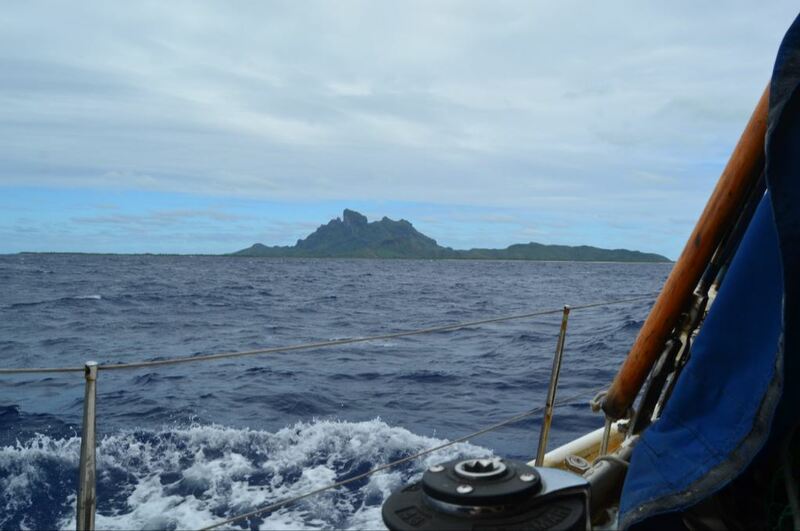 Sail straight to Tahiti past all the atolls that we wanted to see and had been the real motivator for the trip. The lonely unreachable diving spots. The Paradise on the other side of the world. Or we could sail from atoll to atoll, which would obviously be the more dangerous option but it had the more desirable destinations. After all, didn’t they just sail everywhere in the olden days? They didn’t have engines back then, couldn’t we do it too? Guess which option we went for. Yeah, the atoll one. We arrived in Makemo, this time anticipating the lessening of wind as we approached the pass. But we had a secret weapon now. Our dingy was already launched and ready to help. The Jib (front sail) was set strategically to help us along when it came to it. The tide was heading in so that would help us along as well. When we turned into the pass there was slight hesitation and we did so a little too late. 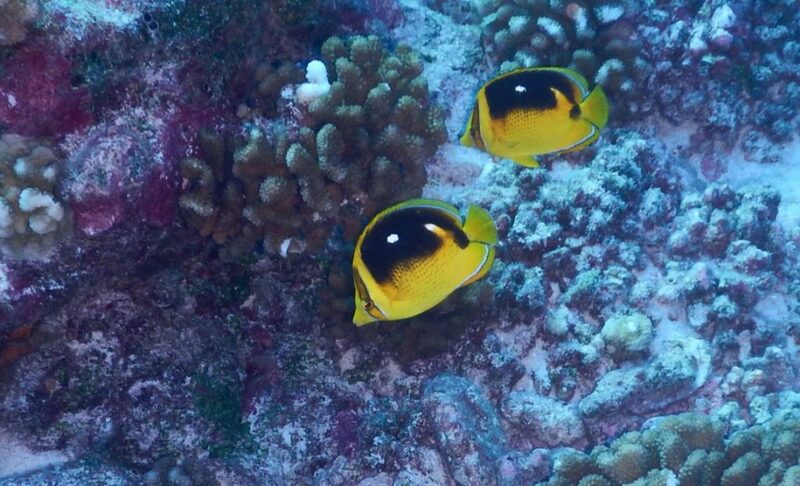 We were too close to the reef for comfort. My Dad was on the dingy, my Mom at the helm. The rest of us were just hanging around, ready to obey any order that might come our way. My Dad wanted to abort right then, but the current was stronger than we had anticipated and the rope connecting the dingy and the boat wasn’t the right one for towing. We managed to turn the boat around to face outward but the sail had backed and the little wind that there was, was pushing us further in. There was a lot of shouting as my Dad tried to get us to roll in the jib and Marike was frantically trying to tie the right dingy towing rope correctly to the boat. Franci and I eventually got the sail rolled in, but it was too late. The current was already taking us in… backwards. It was too late to try and tow the boat, we couldn’t abort anymore, but we could at least try and pull the boat so that it was facing forward again. Marike and my Dad swapped places so that he was now on the boat and she in the dingy. I was handed a buoy to fend us in case we ran into the channel marker. We could literally see the cut off point of the canal right next to the boat, it wasn’t above the water, just a little too shallow for Shang Du. 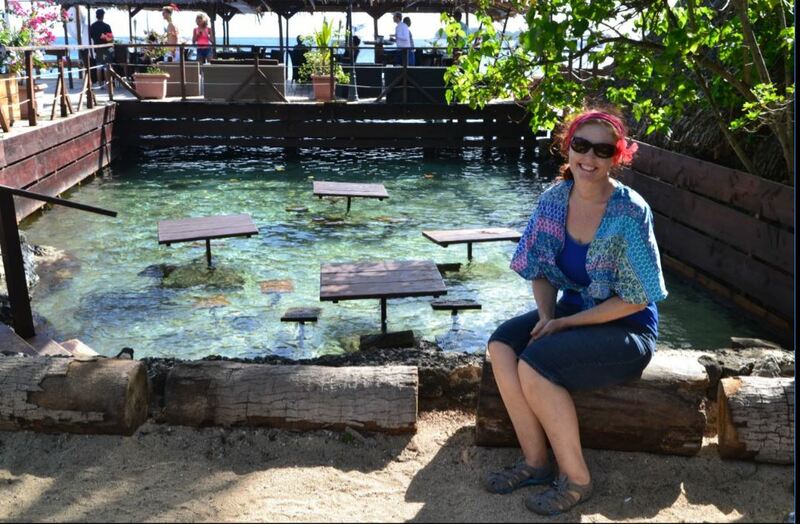 I was looking down into the water at the reef, watching the fish. I could identify them without a mask and everything. I remember watching the shore and measuring the distance, contemplating what we would do if we beached. 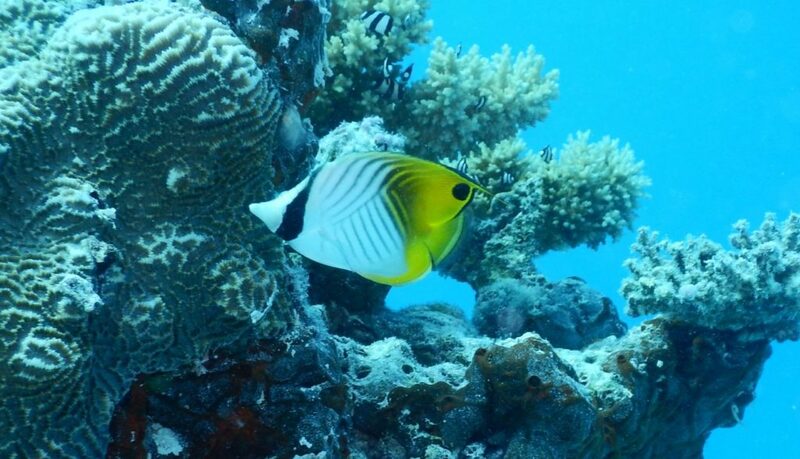 I could see the black tip sharks swimming on the reef, their fins sticking out of the water as they were swimming over a very shallow bit of coral. I was relieved that I didn’t have to be afraid of them, I would have been terrified a year or two earlier. I just kept praying for the Lord for His will to be done. 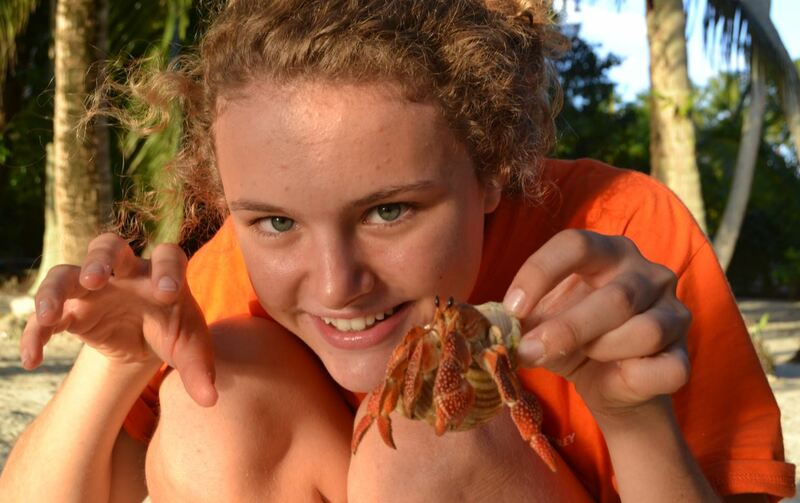 Marike said that if anyone asks what has been the most scary part of your sailing trip so far? She will always, without a doubt, say “Going through the pass in Makemo”. But for me, it was a time of wonder. It’s as if I was sitting in a bubble of peace amongst the sudden storm of stress that seemed to have enveloped the rest of my family. I remember looking into the water with wonder, admiring the wonderful creation of our God. The water was so clear and beautiful, I couldn’t wait to jump in for a snorkel to get a closer look at God’s beautiful creation. Marike who was in the dingy tried to push and pull, but all she could achieve was spinning the boat. When we finally arrived Mom and Dad went to shore to just check things out a little. It was a Friday. They had to take a funny route to the dingy dock because of some shallow coral, going past the only other boat there, they were hailed over by the French man living there. He was a really big blessing to us. He told us that he knew of mechanic living on the little island who was building himself a boat. A nice yellow speed boat. He’s the guy that is maintaining the huge generator for the little island. We said we’d wait till Monday, but the French guy insisted that we go ask the gentleman at least. In the end, the mechanic, the French guy and the mechanic’s assistant came on board. Then they started working on the engine. It was some time in the afternoon by then. They worked until late and came back the next day and the next without any hesitation. Every problem would be discussed several times. First between the mechanic and his assistant in their native Polynesian language, then again in French with the French guy who then interpreted it for us into English after which my Dad and Marike would translate the engine talk into Afrikaans as they explained the complicated bits for us who do not speak mechanic. I understand it a lot better now than I used to, but can still not speak it myself. The island was very small. We never really even explored it, we just swam and dived. We could do this after God blessed us with the wonderful mechanic who fixed the engine. It turned out to be the same problem as it was in Rio when we had to lift our engine out… Sea water had leaked in and made some stuff rust tight so that they couldn’t spin and do their thing, thus breaking the engine. However, other than in Brazil, we caught the problem in time and they could fix it before the engine was gone for. If we had gone on sailing between the atolls, or even just done the longer crossing to Tahiti, the engine would have seized entirely and we’d have had to replace it. But God is gracious and blessed us greatly. It’s amazing how he works in our lives. When going though the passes without the engine the question “Why, God? Why me? Why now?” always comes up. It tends to do that in the hard times, but God was gracious and let us get it fixed in time despite the stressfulness of the situation. If we hadn’t had engine problems we wouldn’t have met the French couple with whom we could share the gospel. So it’s always a question. Why does God put me through this? Our problem is that we’re too centred on self, and not others. God could have put us in that situation for that explicit reason to reach out to those people, but if we’re too centered on self than we won’t see those opportunities as a God send. So instead of asking Why? We should ask How? How can I glorify the Lord through this situation? Kon-Tiki – by Karin Jnr. Ok, so this blog has some lessons in history included. Just a warning to all you people out there who’ve already had too much of school, despite the fact that it’s only just started. It’s a pretty cool history story, and I’ll try to keep you interested. If I’ll succeed is another thing, but I need something to keep me interested don’t I? So a couple of years ago, I’m not sure how many, but it wasn’t in ancient times, and it wasn’t the other day so I guess you could say ‘the olden days’ as in the, ‘they didn’t have internet when I grew up in the olden days’ speech coming from your parents or quite possibly the ‘When I grew up in the olden days we didn’t have toilets inside the house’ speech coming from your grandparents, or maybe just the universally known one ‘The young people today are just not like the kids in the olden days. We were respectable back then!’ I guess it could possibly also have been in the olden days as in, ‘We didn’t have cars when I grew up, We had to hitch up the wagon whenever we wanted to go anywhere.’ And I’m not quite sure who’d be giving that speech as I’ve never received it, but probably some ancient family member that is well beloved. Anyway, there were cars, so it wasn’t that long ago. The story starts in Norway where some gentleman decided that the people who populated Polynesia had to have come from South America because of a lot of reasons but the main one being (as far as I could tell) the religion and culture similarities. But everybody else said that the Chinese populated Polynesia… Thor Heyerdahl, our subject of study today, was highly humiliated as people refused to believe him. He thus decided to prove it, gathering together a team of crazy people hungering for adventure. So what did he need to do to prove everybody else wrong? Well, he had to reach the Polynesian islands equipped only with what South American Indians would have had back when people estimated they had taken the jump. He and his team proceeded to go to South America and had a mini adventure right there trying to get the right wood to make the rafts out of. The newspapers were all over them by the time they actually stocked up the raft and left, almost leaving a crew member behind and getting a parrot as a departing gift from some random native in the chaos of trying to get away. The Port captain had told them that he didn’t think their boat was very seaworthy and that it would sink within the first week, but they ignored him of course, being the stubborn Norwegian men that they were. With them they did not just take the coconuts and other supplies that the long gone natives would have had, but also a radio and some other complicated stuff meant for safety. Now, not one of these five men were experienced sea men or really knew about this sort of thing. Four of them were Norwegian and the other one was Swedish. They didn’t go at a tremendous speed but they were going. An airplane flew out after them to say a last goodbye, and they communicated over the radio, but despite all this, the airplane never saw them as they were too small and flat against the water, which just goes to show that even if they did have the option of being saved at any time in their voyage they wouldn’t have had much of a chance. So the airplane left. 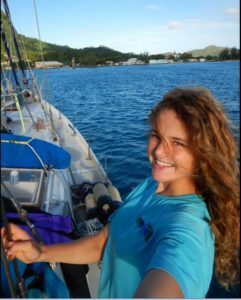 They were now on their own for a two month journey to Polynesia, with no engine or hope for help if they sank or ran out of supplies or something. The tinned food they brought with, soon rusted open and got contaminated as they continually got washed over with salt water. They were always wet and honestly I have no idea how the radio stayed fine, but it did because later in the journey they actually managed to talk to people in Norway.. They survived by catching fish –mainly Mahi-Mahi, who are quite wild but delicious- they liked swimming but were deathly afraid of sharks, whom they caught and killed for fun for some reason. I think the whole idea was to cleanse the water around them of sharks, but that logic doesn’t make much sense to me since the blood from the dead shark would only attract more sharks and to kill the entire ocean’s population of sharks is pretty impossible for just five men on a random raft in the middle of the ocean. Their little raft ended up becoming a little ecosystem of its own as seaweed grew along the bottom. 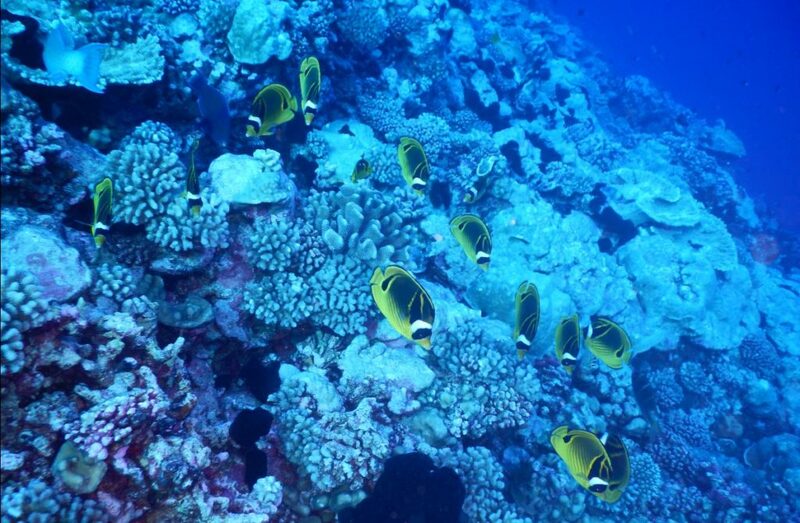 This created shelter for little fish, which created a reason for bigger fish like Mahi-Mahi to come closer, which resulted in Thor and his friends never having to fear starvation. I’m not going to recount the whole story. You can go and read his (Thor Heyerdahl’s) book if you really want to know. But the really important part of this story is that when they finally did reach Polynesia (they almost missed it) it was on a little atoll named Rarioa. Of course, as a boy my Dad having heard of Thor’s adventures had found the idea so romantic and awesome that we had to stop there. My Mom read the book to us on the way there and we went to the exact little island where they landed. Oh dear! I completely forgot to mention that they named the Raft Kon-Tiki after some important historical member who featured both in the South American stories and in the Polynesian stories but with a slightly different name. So they named their little island Kon-Tiki. And we went over there to explore it too. Now I don’t know if you know, but an atoll is a round circle of coral. But not all the coral sticks out of the water, those that do catch coconut husks and stuff which ferment into dirt and sand and thus they become ‘little islands’ that is what I was talking about. When Franci and I reached the age where we were reading a lot, my Dad supplied us with many adventure books. Specifically books that he felt had helped further his “sail around the world” dream. Willard Price’s Hal and Rodger series seemed to have played a big part. It was in one of those books, “Pacific” that I first heard of pearl divers. At that time I did not have the foggiest idea where the pacific was, but I knew they had pearls. 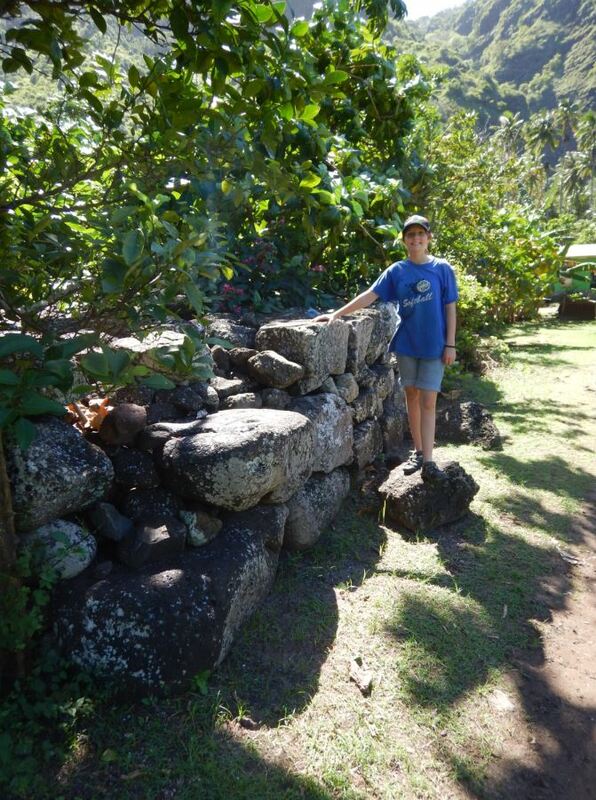 Nuku Hiva was our very first Pacific island. (Well, South Pacific island. I suppose the Galápagos are islands in the Pacific too.) 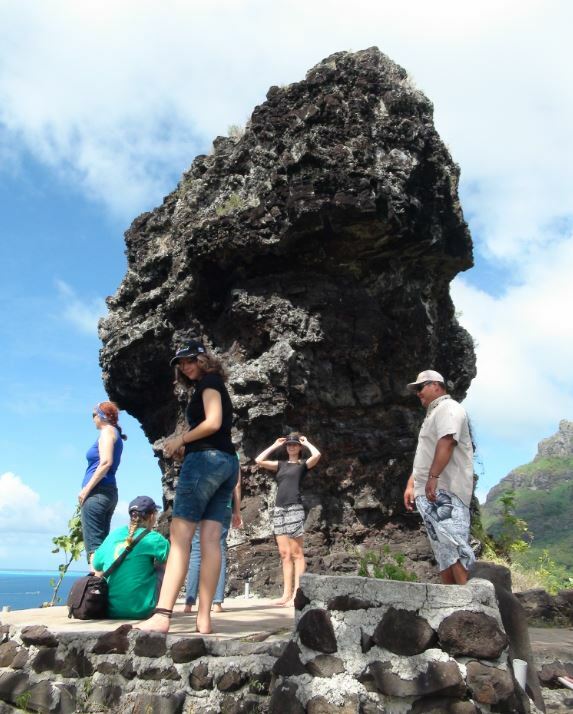 But though Nuku Hiva was great, it lacked a key feature: clean water. 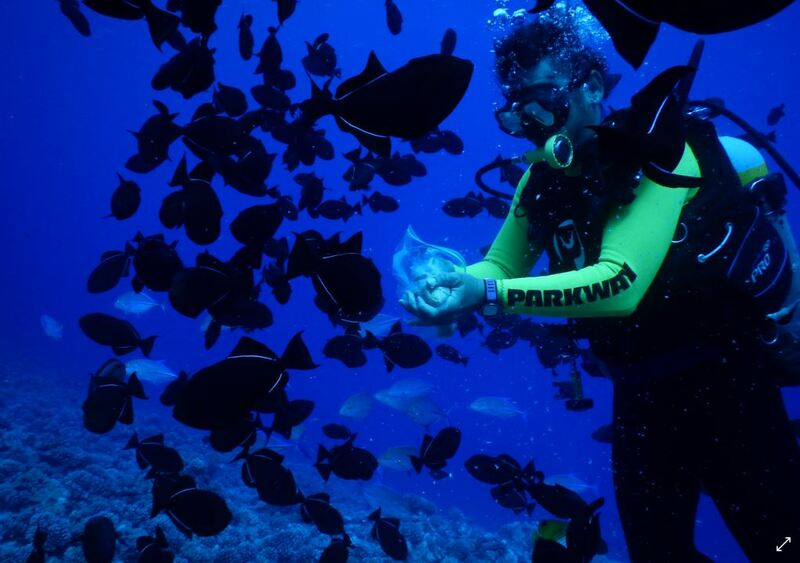 Not that the water around Nuku Hiva is polluted – it’s just not clear. Looking back at our stay at Raroia it was jam-packed with excitement! 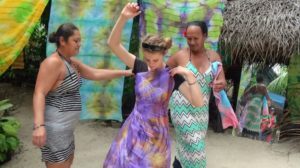 The excitement of meeting Pacific fish life for the first time (other than mahi-mahi), Kon-Tiki island, pearls and celebrating Karin’s 15th birthday all featured in the busy week spent at our first atoll. 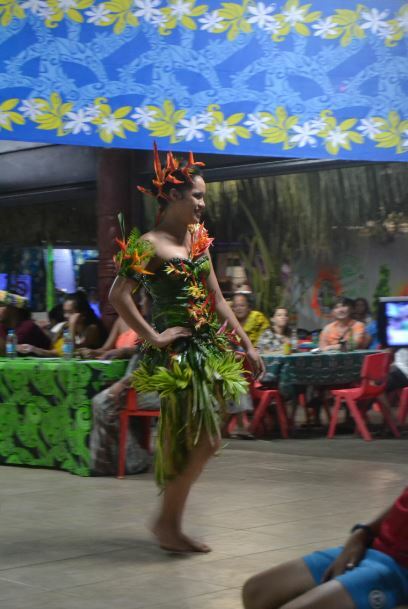 While we were in Nuku Hiva, we found out that the month of July is a festive month for the people of French Polynesia. 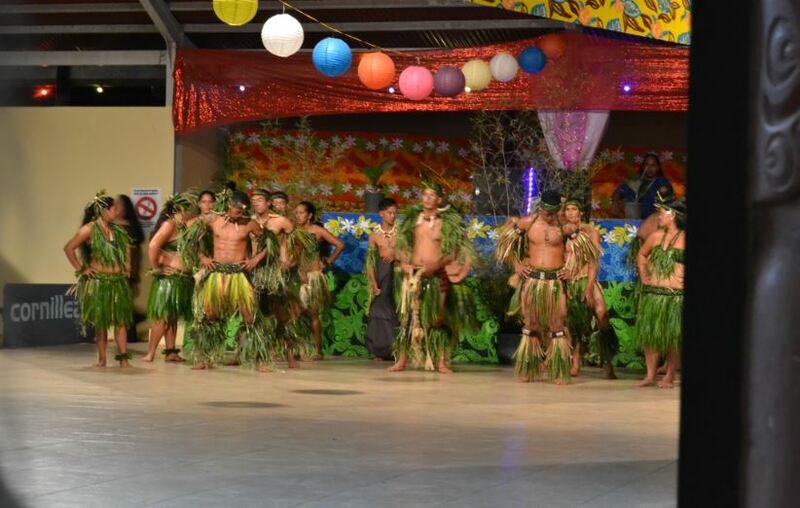 They have inter-island dance competitions and a general festive air is adopted over the weekends. They were not able to find out a whole lot, since everybody speaks either French or Polynesian. They did manage (through Google translate) to find out that there was to be some kind of sports event in the afternoon. After all six of us arrived on land, there didn’t seem to be much going on, so we walked down the village’s one street to the house of a very friendly local who had talked to my Dad and Sophia earlier. She was selling pearls! 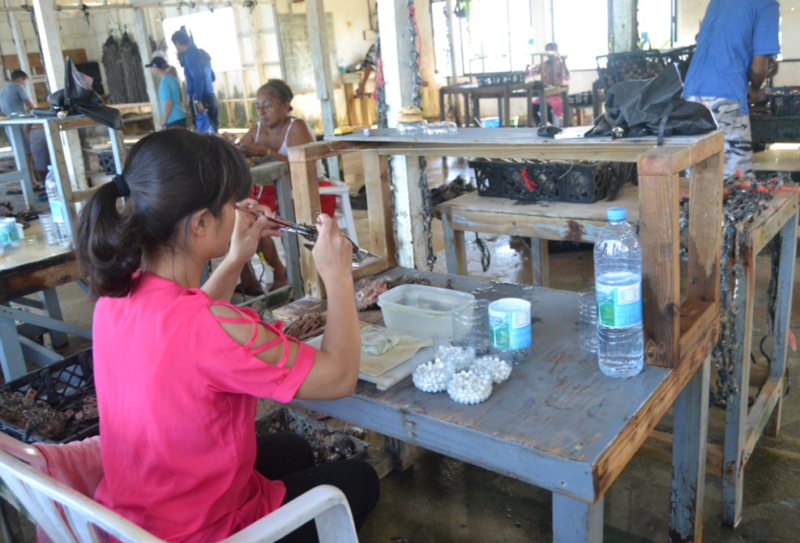 On the opposite side of the atoll there is a pearl farm. I’m not at all sure how the logistics work, but the pearls this lady had to sell came from that farm. We were greeted with smiles and as soon as we made our intent clear, all was bustle to set up the tiny camping table on which to display the pearls. 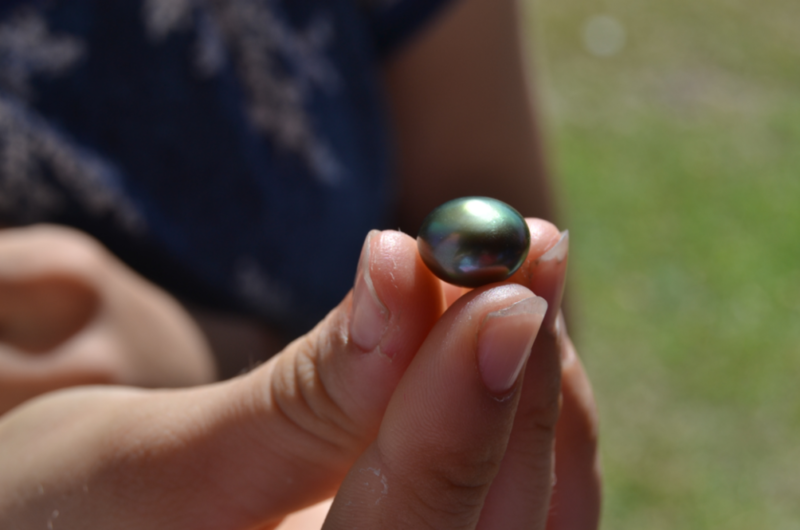 The pearls were mostly dark – the better the quality, the lighter the colour and the rounder and smoother the pearl. 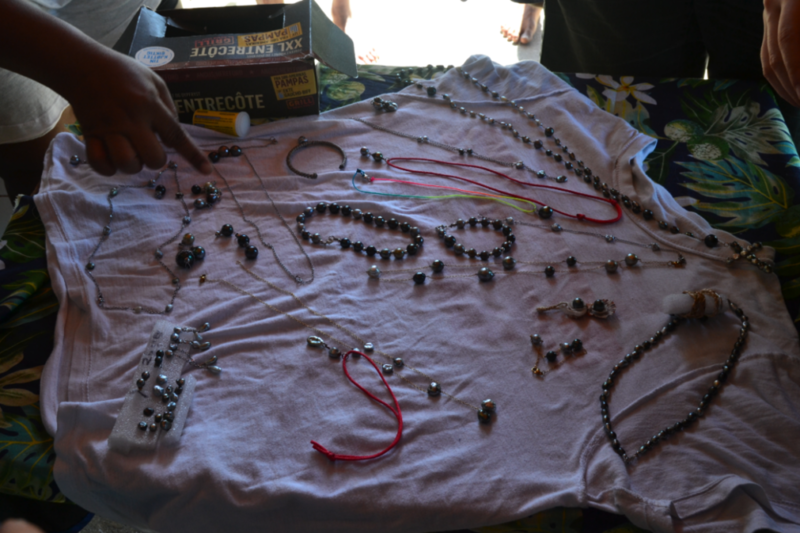 There were a few loose pearls, but mostly they were set in earrings and necklaces. It was wonderful to take a smooth, dark pearl and hold it up to the light. There are many colours that shimmer under the surface. Shopping done, we wandered around the motu. 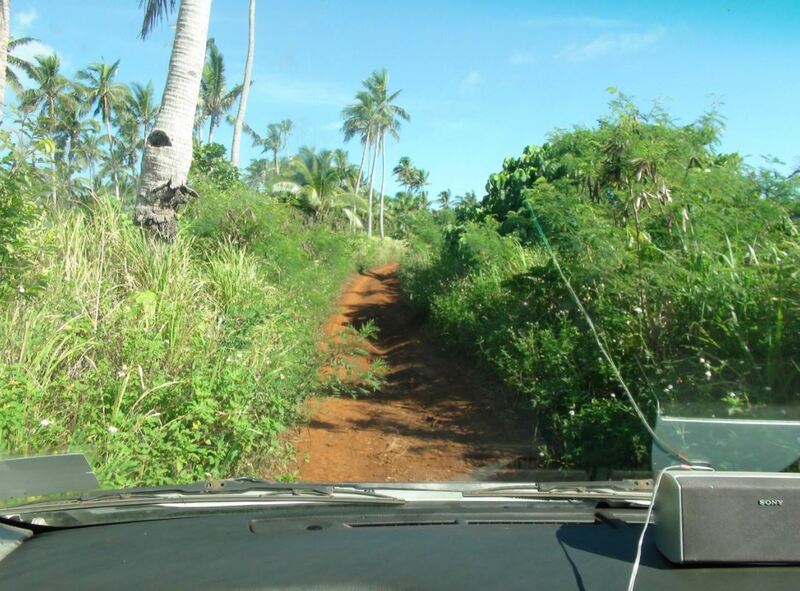 There is one road running almost the length of the village and ends up at the airport. Actually no, it’s not really an airport. It’s more like a runway with a big, open shed to one side. When we were there the little office was locked and a few construction cones huddled around a mobile staircase. 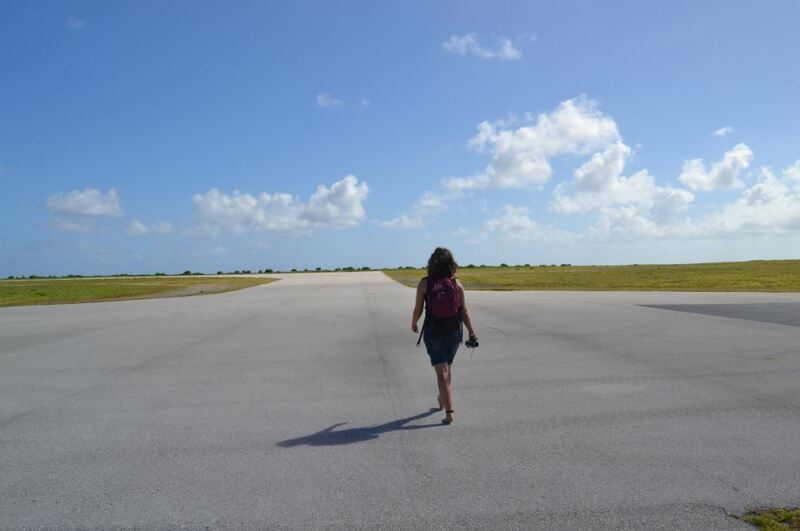 You could walk all the way down the empty expanse of runway if you so wished, but it was hot. The sports event, we later found out, was extremely low-key. There were a bunch of people standing around, but mostly waiting for something to happen while the main competitors ran about the island with coconuts, so we didn’t see much of them. We as yachties were, of course, extremely noticeable. They do get quite a few sailing boats there, so they didn’t make a fuss, but everybody still knows immediately that you are new. The people were very friendly and tried to answer our questions as best they could via Google Translate. At one stage we tried interacting with the kids some. I asked my Dad for the tablet and all I was doing was having the kids spell out their names so I could have a better go at pronouncing them. There was one little girl that kept on trying to tell me something. A simple sentence that simply went right over my head. She must have been about seven or eight, so in the end I had her spell out on the translator what she was saying. After staring uncomprehendingly at the English for a while, (Google translate is great – it’s just not always very good with converting sentence structure . . . also I have no idea how well she could spell…), I finally understood that she wanted “to show me something”. Once she had my attention, up she popped and tumbled head over heels into a cartwheel. Although not smooth, it was adorable and she was properly “ooh”ed and “aaah”ed afterward. To return the favour, I showed her how to get into a bridge from a standing position and, since I had just learned how to do this, I kicked my feet over my head. As soon as I was right way up again, she had me help her perform the same daring feat. Trusting me absolutely, she had me hold her going down into a bridge and then support her as she kicked her feet back over her head. Her playmate also had me repeat all the same steps again and and again. I rather overworked the French “voila!”, since my French vocabulary allowed for no other exclamations of affirmation. We really struggled to ask any questions, even with the help of Google translate, but everyone remained super friendly and helpful, willing to show us what they were doing. That afternoon they were seeding oysters. Oysters that had been growing in the comfort and safety of their enclosures up until the point where they were rudely pulled from the water and hauled into the big wet shed. In this big, wet shed, they are dumped on a processing table where there are one or two men with big rough tools. The men expertly tear off oysters from the clumps they had been growing in and then use their big, unwieldy looking tools to pry open the oyster’s tightly clamped shell and neatly insert an orange wedge in the slit. They work fast and it’s easy to see they’ve had a lot of practice. 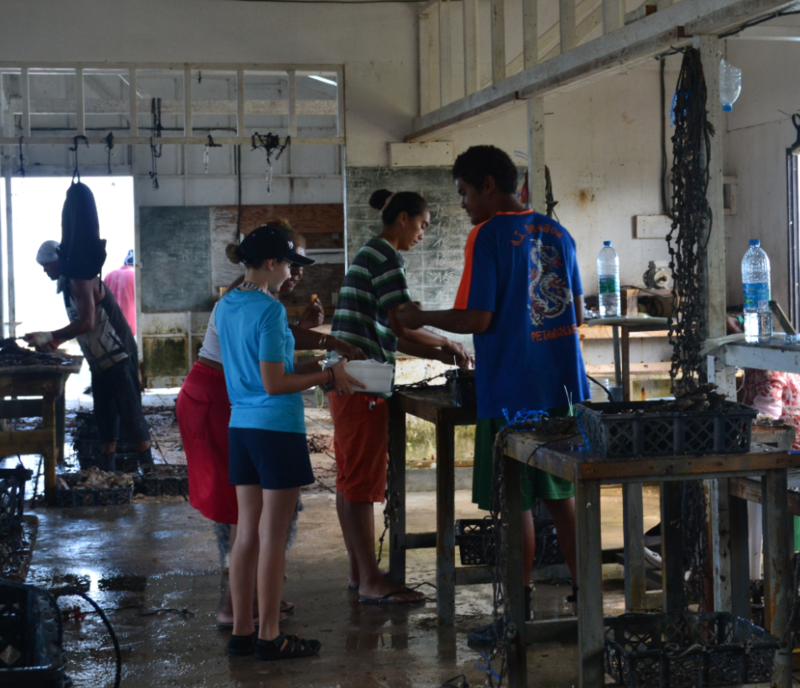 The oysters that are wedged open get packed into crates and are then placed at the seeding stations. Each station had a person sitting before it with a series of very specialised tools which I will NOT endeavour to name, but will have to show you a photo of. 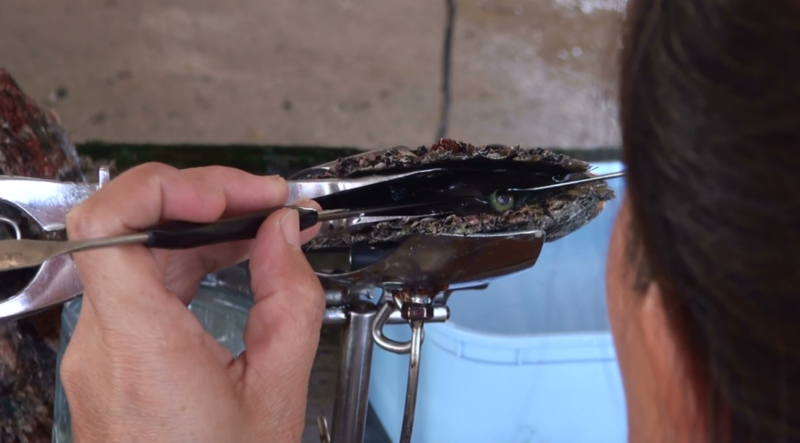 As each oyster takes its turn, it is placed in the clamp to firmly hold it in place. A new tool is inserted into the mouth of the oyster and the wedge removed, providing a clear view of the internal workings of that oyster. Using their special tools, the seeders will cut a tiny slit in the pearl pouch (as I have come to think of it) of the oyster. Into this comes the “seed” along with a bit of lining to help with the healing. The “seed” is a plastic ball, treated to be especially non-irritant to the oysters. This ball will then over time be coated with the lovely pearl shimmer. It was very interesting to watch the process. After seeding an oyster, it would be dumped into another crate. 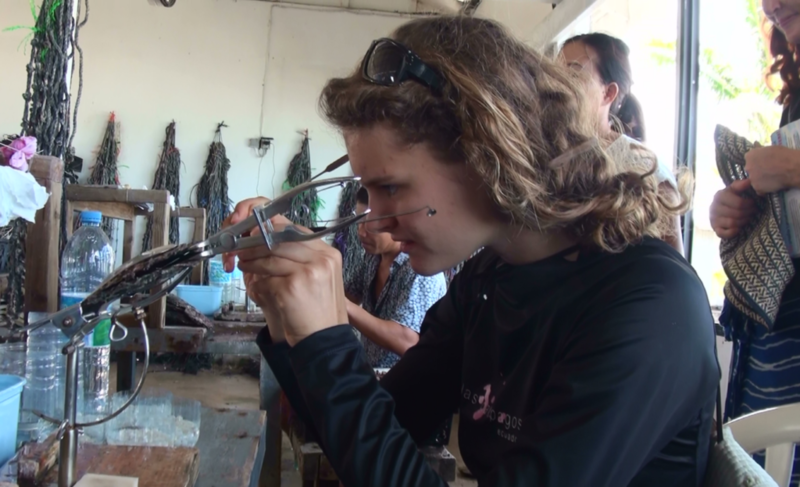 Each oyster then gets a tiny little hole drilled through a ‘shell-only’ part of it and eventually gets strung up onto ropes with fishing lines. These ropes, lined with the seeded oysters, are put back into the water. We were invited back for the following day – we were made to understand that in the morning, around 9o’clock they would be taking out pearls from the oysters. That was a lot of fun! 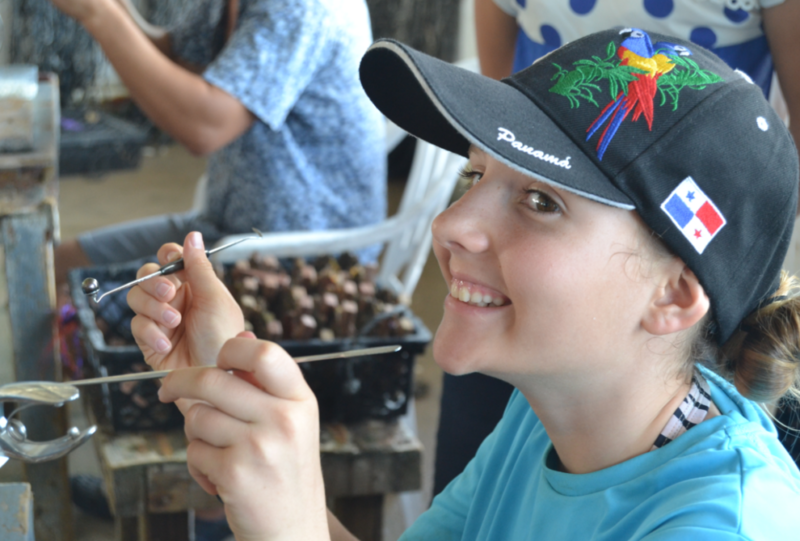 Seeing the way in which the oysters were seeded was very interesting, but seeing a pearl being taken out was enormously satisfying! The shed didn’t look any different in the morning – still big, full of noise and still wet. The stations were all nice and busy, crates were being hauled around. To see the difference you had to go stand right next to a seeder. 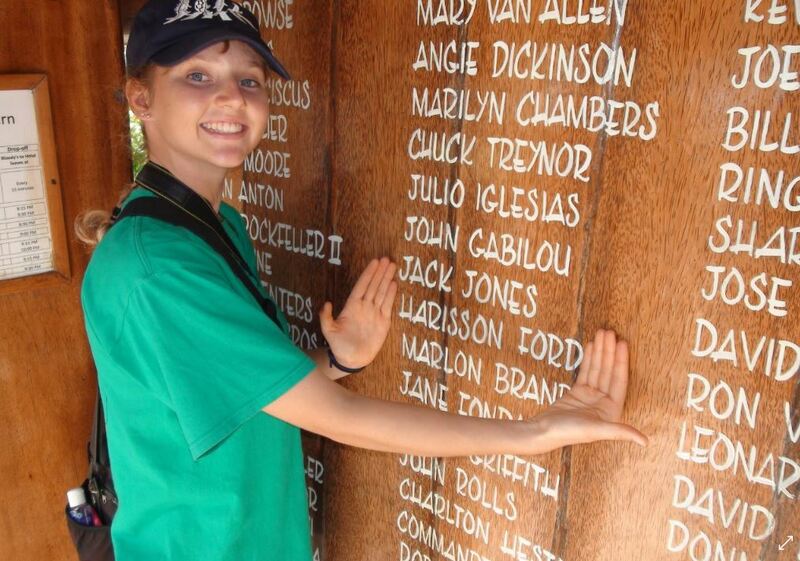 Only now they weren’t seeders any more – now they were treasure seekers! They were very kind to also allow us the chance of taking out some pearls. 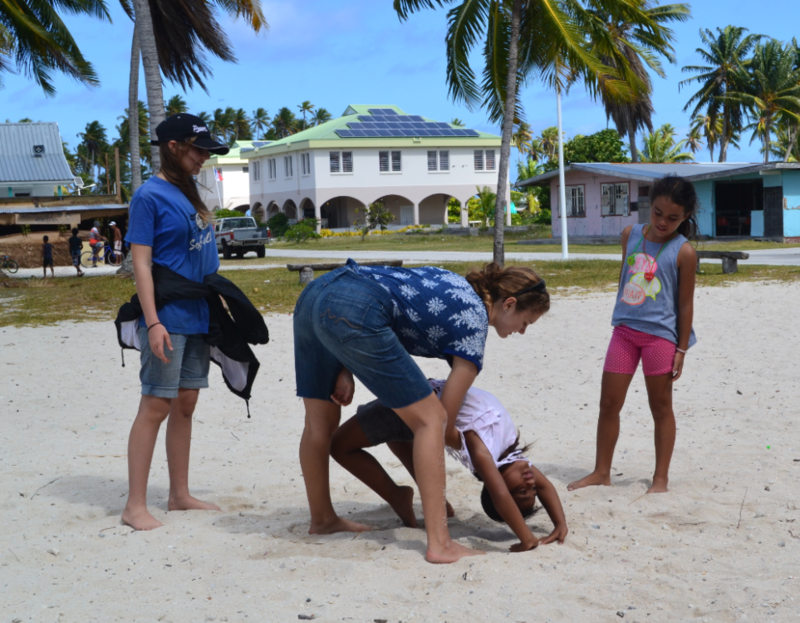 Here is Franci being helped – it’s much more tricky than it looks! Most oysters have pearls in them, but not all of them. Some are empty, some only have a little rice-crispy-like fleck hidden inside. It’s fun to stand and watch. The treasure seeker positions his/her oyster, putting in the tongs well to the side of the oyster’s lips to have maximum visual of what’s inside. Then comes the careful prodding of the pearl sack. Is there something inside? A pearl will show up with a big bump. A slit is then made into the sack and carefully the pearl is extracted with the funny cup tool. 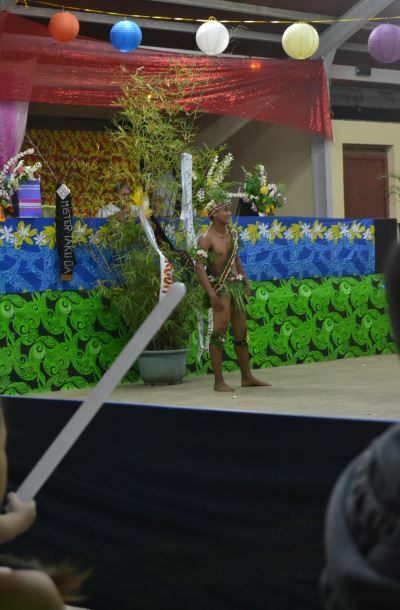 Polynesian Dancing….sort of. – by Karin Jnr. Frankly, when we arrived in Nuku-Hiva I was quite relieved. We had read a book that took place on the island. It was written quite a few years ago, when there were still cannibals prowling about. The place that they write about in the book actually exists. The writer had spent some of his years on the island and used an actual real location instead of inventing a whole new spot on the island. That was pretty cool. The book was sort of boring sometimes, since it was rather old and not the sort of gripping tale we’re used to today. But because we were actually heading for the island at the time it made it more real and interesting. I did go to shore eventually. They enticed me with Wi-Fi. But that’s not important or interesting, so I’ll skip to the juice. 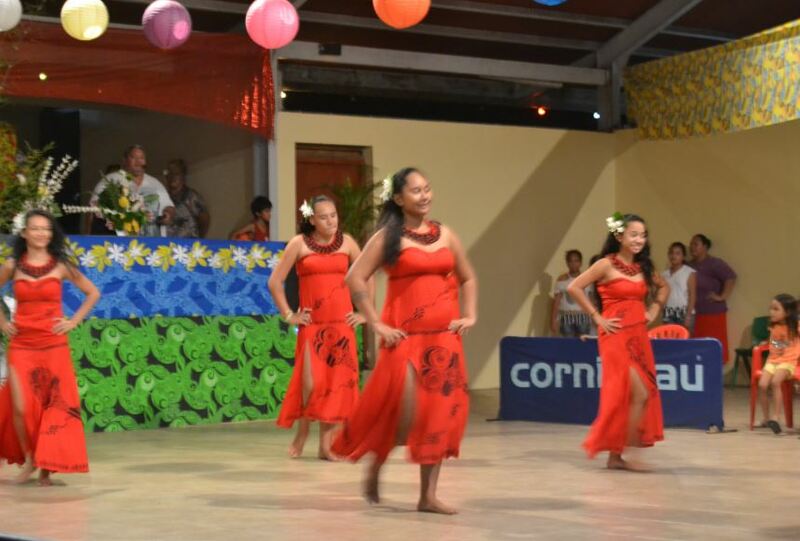 We attended some sort of dance carnival thing the second night there, I think… Some boat friends, who had already been in Nuku-Hiva for a while, joined us. The thing was supposed to start at eight, so we arrived an hour early because we wanted good seats and also to eat there. We got a reasonably good table and ordered our food. (Fun fact, the percentage of tomato growth on the island was low for our stay there. The restaurants, which only opened for this time of year, got first pick at the market, and they scavenged all the tomatoes there were. So if you wanted some tomato you’d have to order it.) Our food arrived and the portions were huge! Luckily we had decided to share instead of each getting our own. The other kids, all smaller than us, each got their own and had to take doggy bags. It’s important to note that Nuku-Hiva is French territory. So their food is nothing to sneeze at. So at the other French islands we’ve been to, it’s usually smaller portions of great quality rather than big portions of quantity. Here it was both Quantity and Quality. When I look at the Polynesians I’m not really surprised. There are fat ones among them, but few of them are obese. They’re just built bigger. Look at Maui from Moana. If he doesn’t look typical Polynesian I don’t know who does, without the moving tattoos and Giant fishhook though… they don’t all have those. So we waited for the thing to start. We weren’t very sure what it actually was because of course they all spoke either French or Marquesan, only a little bit of English. All we knew was that it was supposed to be cultural. It turned out to be some sort of fashion show. There were four models, three female and one male. The first few outfits were made out of plants and stuff, I guess to be a sort of memory to their ancestors who were… uncivilized. Then it went and progressed on and on to more modern stuff. It was rather interesting to watch, between every ‘level’ they’d have a short interlude where something else would happen. A few times it was a little play acted out by the guy who announced the stuff and some other two guys who used a broomstick as a pretend gun to shoot the woman in blue who was pretending to be some kind of bird. The narrator guy was a… game official kind of person and I think they were disputing if the guy who shot the bird was allowed to keep her since it landed on his neighbours’ land or something. I’m not sure. Maybe it was plain Tapu (forbidden) to shoot the beautiful bird. I don’t know. It was quite interesting to watch though. 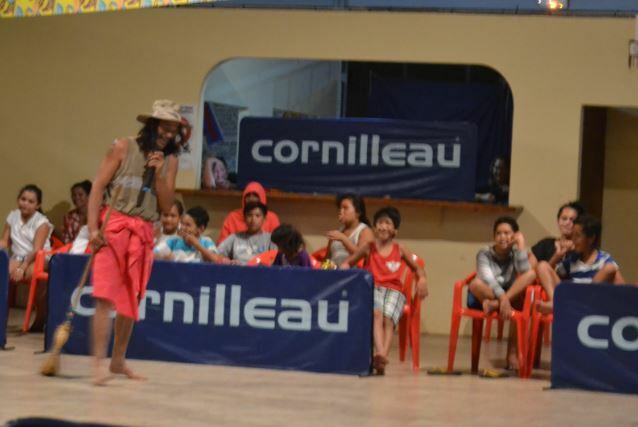 The skit was in French for the few other tourists who were typically from France since Nuku-Hiva is French territory and all… But we still didn’t understand much. 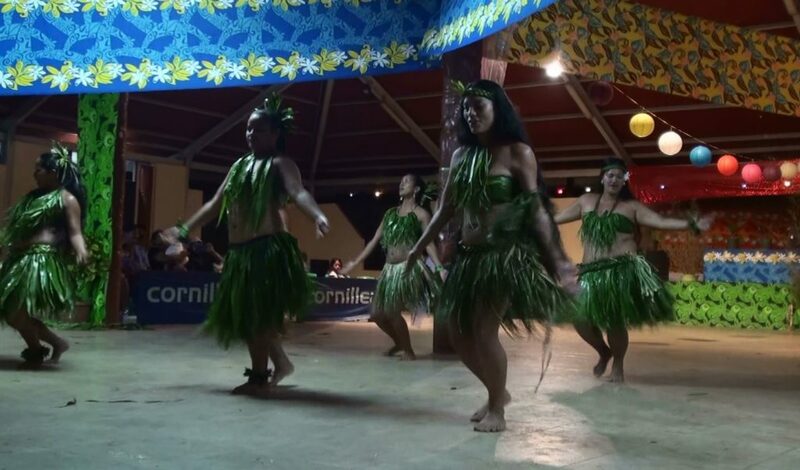 Once the interlude filler was a Polynesian dance that was what we thought we’d be coming to see all along. It was pretty and cool. The next weekend we were still there, and they had another cultural thing. The guy at the Marina shop (he was formerly American or something so his English was good) told us that it was going to be more dance this time. So we went. The performance proved to be more centred on dance than the previous time. There were a lot more people, but still very few tourists. We got the feeling tourists were more of an extra than the income. Nothing was done specifically for us; they were doing it for themselves, not to impress the odd tourist. 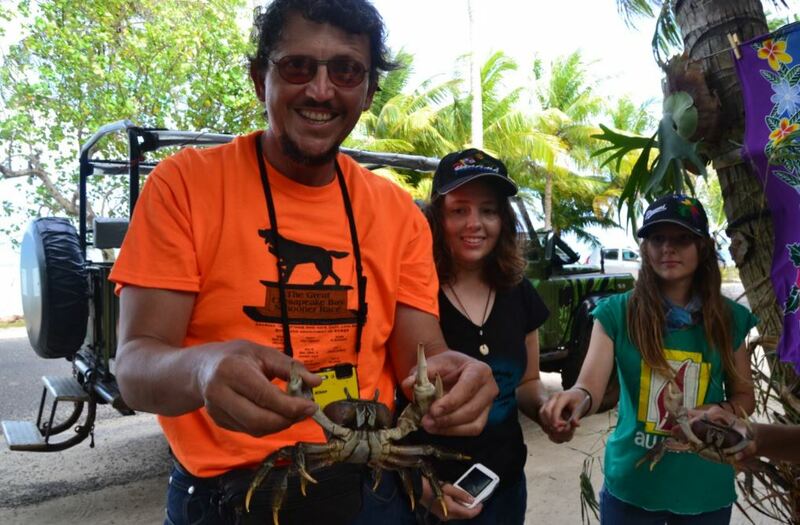 It was a very refreshing feeling after the Galapagos, where the main thing is Tourists. The ‘How can I impress the tourist’ mindset just wasn’t there. It was impressive dancing. The guys’ dance moves are strong and solid, completely different from the women who flow and sway. The guys’ dances are aggressive, with loud calling and unisons of ‘huh!’ sounds. 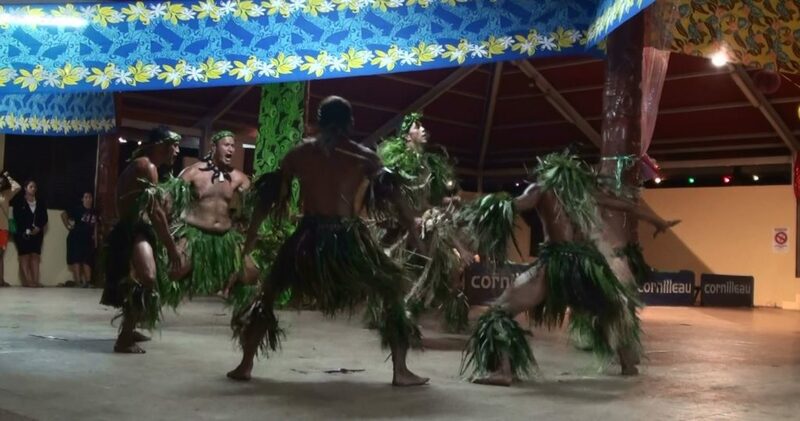 I’m very sure that most of the people reading this blog will have seen a Haka performed by the New Zealand All Blacks – well, there you have a little glimpse into what the Polynesian war dances look like. That’s exactly what a Haka is, it’s a war dance. The woman were a lot more graceful – you can’t see it in the photo, but their hips are swaying like crazy! I think that’s all I got to say about the dances. So there you have it, a completely uninformative blog as to how they actually dance, but more of a rough image that tells you that they do indeed dance. I think the dancing was one of the coolest stuff about their culture… Ok, maybe not. There is always the awesome tattoos and all the other stuff, but I won’t go into that. 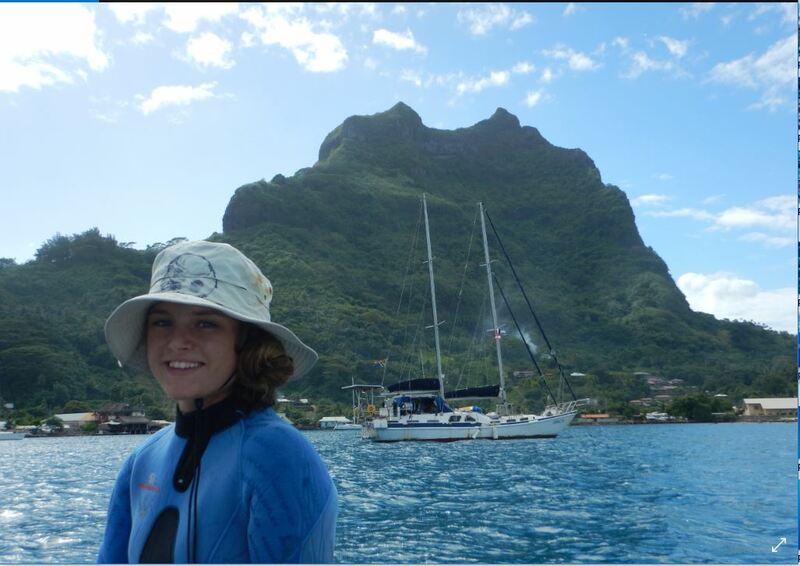 Nuku Hiva didn’t have very clear water, but it wat GREAT to see land again! Nuku Hiva is an imposing island, with shear walls curling around the sheltered valleys. Once we were anchored inside the little bay, we were almost surrounded by land, as the opening to the bay isn’t that big. What do I remember of Nuku Hiva? Huge pampelmoes (grapefruit that tastes exquisite), everyone wearing a flower behind the ear and also the steamy hot-house feeling in the late-afternoons after a rain shower. 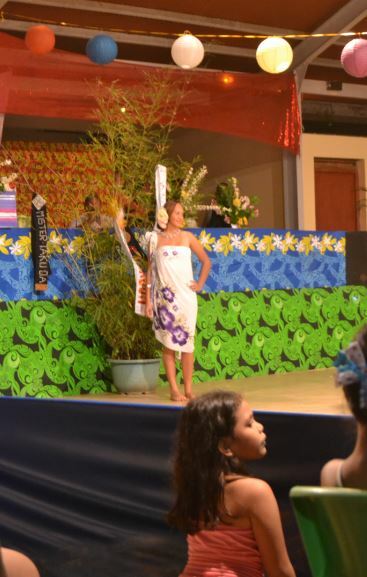 Nuku Hiva is part of the Marquesan group of islands, which in turn is part of the bigger French Polynesia. This, of course, means that there are subsidised baguettes for sale in the tiny little shops! Yay! On Saturdays there is a mini-market close to the dock for the tourists. 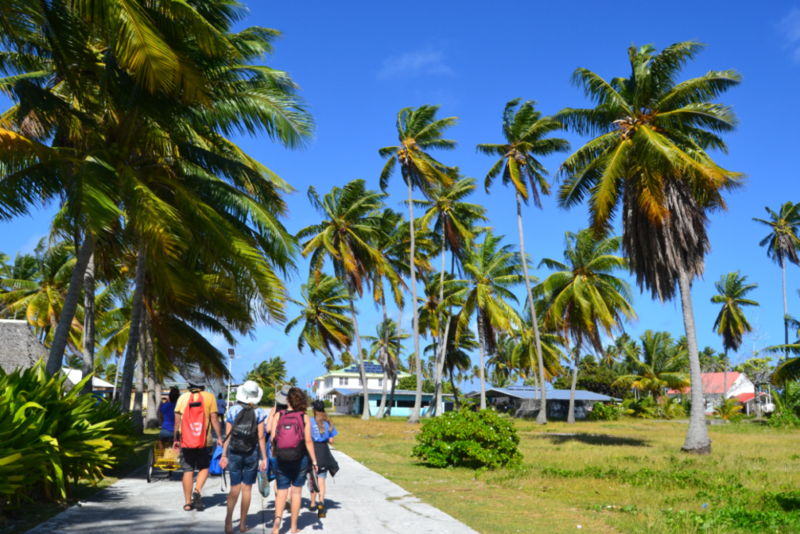 (One thing I LOVE about islands: everything important is within easy walking distance!) Vegetables sell out really quickly, so if you want vegetables you need to be there early. In the tropics there are more than enough fruit – it’s the vegetables that don’t grow so well. At this mini-market they also sell some local … puddings. They would be cakes, I suppose, except they definitely jiggle. They taste really good. They had a sago-pudding like texture, but not quite. I think they were manioc puddings. They were yummy. We read a book on our crossing from the Galápagos to Nuku Hiva: Typee by Herman Melville. 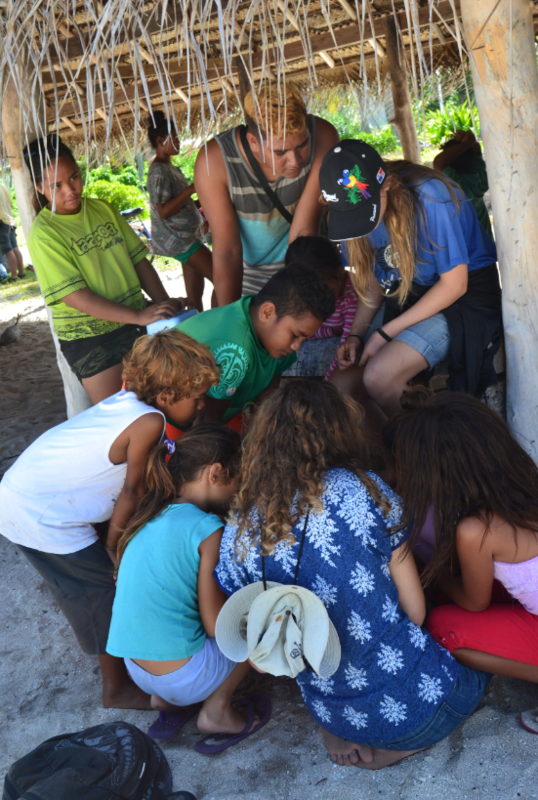 It really enriched our experience of Nuku Hiva, by introducing us to strange words and concepts before we encountered them in real life. It’s an old book, describing life as it used to be for the Polynesians who lived on the island in the time before there were a lot of European people there. 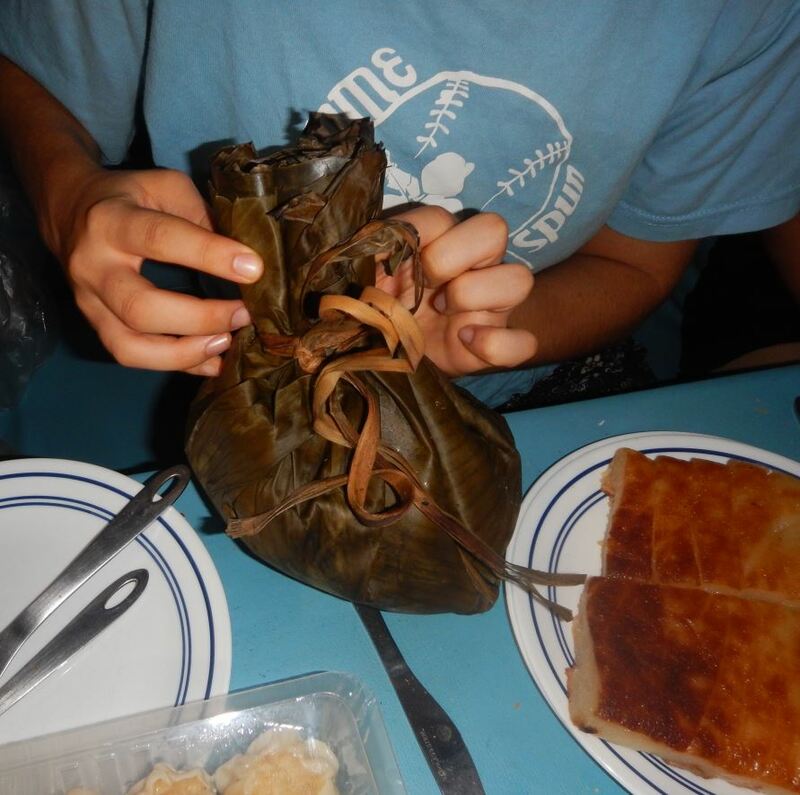 Many of the things we learned from the book are only relevant to the history of the island, but there is one specific thing we learned from the book which is still quite prevalent: the eating of “pooey-pooey”. To my great delight, we actually had the opportunity to taste some! 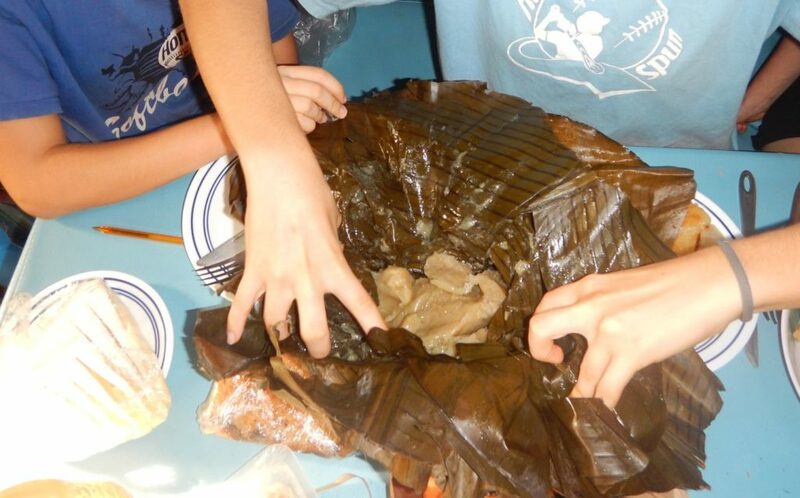 Pooey-pooey is a kind of sticky goo made from fermented breadfruit. It tastes a bit like beer and none of us liked it especially. It was just very cool to know it really exists! In the book, the hero is constantly mentioning pooey-pooey as a dish the locals eat. Typee is one of those older, really descriptive books where the setting of a scene takes priority over any action that might serve to keep a story line going. It seemed as though every meal had to be carefully documented and pooey-pooey was a major recurring theme. We love coconuts! 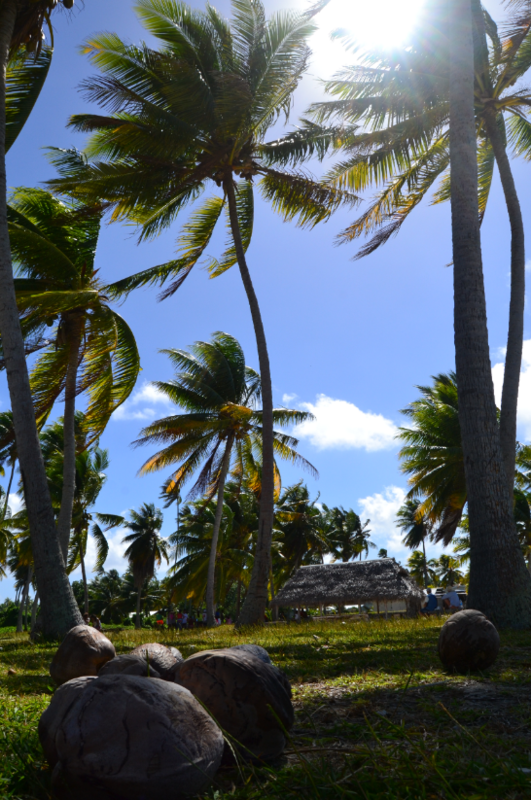 Nobody pays for coconuts on Nuku Hiva. You just pick them up from the ground. 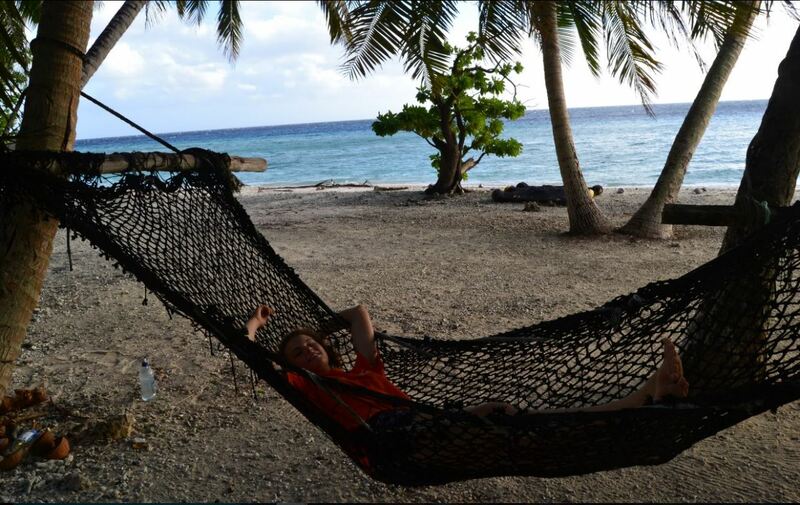 We didn’t spend nearly so much time in the South Pacific as my Dad had hoped we would. We have learned the hard way that sailing is mostly being stuck in places you don’t specifically care for and skipping through the spots that are the stuff dreams are made of. Some time ago we worked out that around a third of our time, we actually spend at sea! That is, actively moving from one place to another. 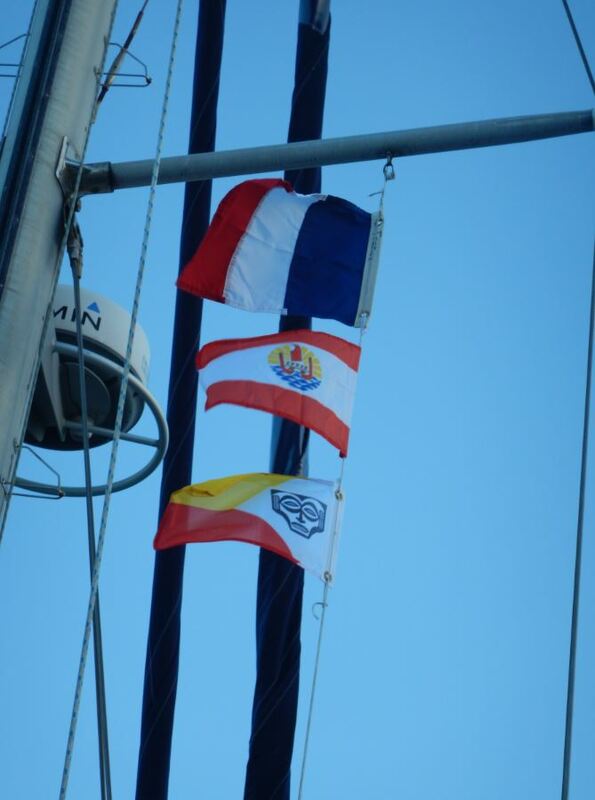 From top to bottom: France; French Polynesia; Nuku Hiva. Even though Nuku Hiva wasn’t the diving utopia my Dad really wanted to get to, we still could have stayed in Nuku Hiva for a month! 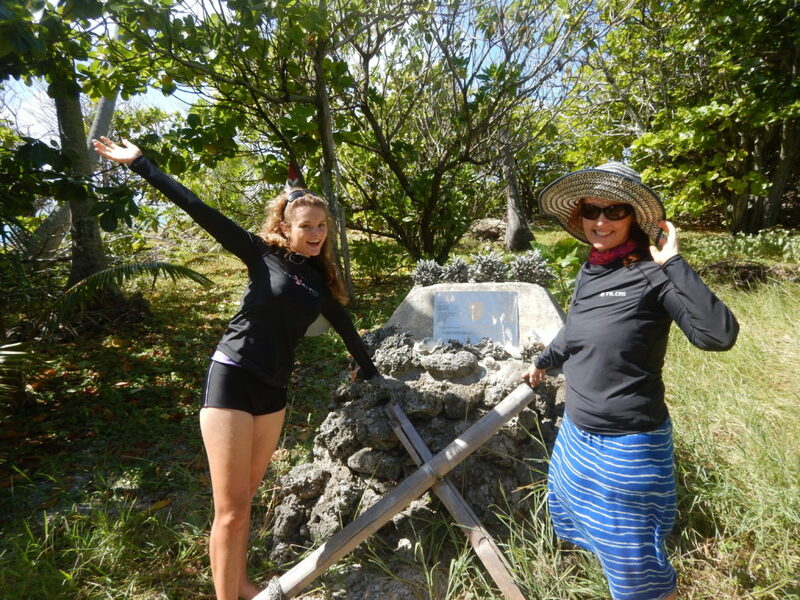 It was the island where we learned the most about the historical culture of the Pacific. Many factors led to us having such a rich experience in the short time we were there. 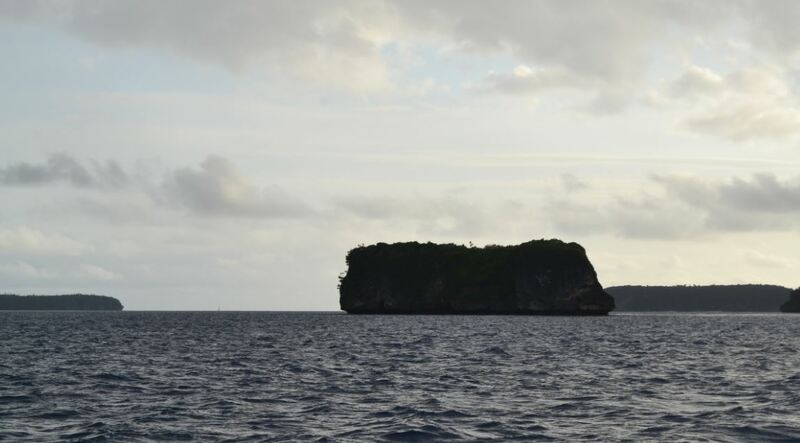 Nuku Hiva is a little out of the way – there are very few people actually living there. No big towns, only quiet villages. “Out of the way” also means that it doesn’t attract many tourists. Sure, quite a few yachts come by, but cruisers do NOT inspire the same hustle and bustle as holiday-goers would! Everything is relaxed. Overall people work on ‘Island time’. The main thing we spent money on was the island tour. Up to date the Nuku Hiva island tour has been the best we’ve ever had – mostly just because there is so much to work with on Nuku Hiva! The island used to be rather over-populated before the European settlers arrived, so the island is choc’n’block full of … stuff. 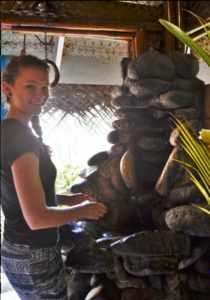 Old meeting grounds, pi-pis, shells and rocks used for tools, some old tiki – the list could go on. We kicked off the tour with a lovely look-out over the bay and then headed to another part of the island. 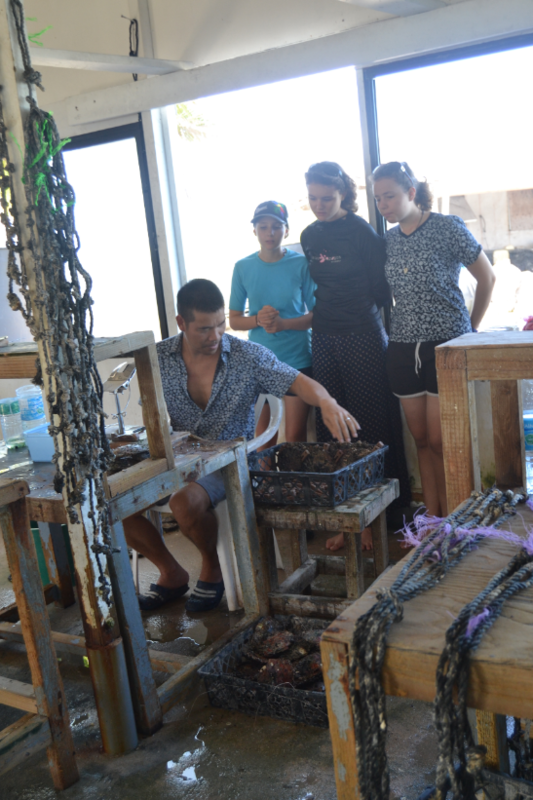 Our guide, Richard, told us stories about when he was young. How everyone used to ride horses everywhere and how they trained dogs to smell out where the chickens were hiding their eggs. Now, of course, they don’t have to do those things anymore. The French government has built a lovely road for cars to drive on and there is now a chicken farm on Nuku Hiva. The club my Dad is holding is specifically Nuku Hivian. 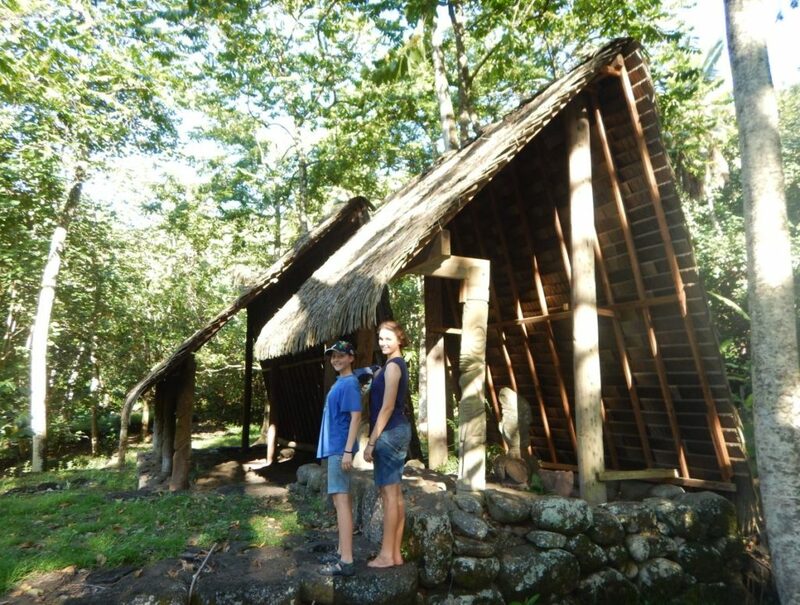 We did many various and wonderful things, including a visit to Typee valley, the place where Hermin Melville’s novel is located. We saw many pi-pis. Pi-pis are large, rectangular blocks of piled rocks. The individual rocks are quite large and they are stacked carefully into these platforms that the people used to build their houses on. I have no idea how old they are, but I’m guessing pretty old. 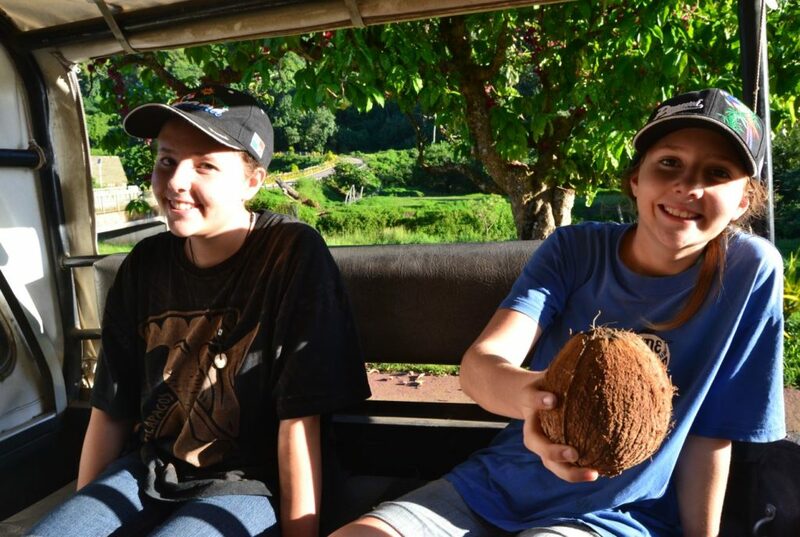 All through the tour we were allowed to pick fruit! 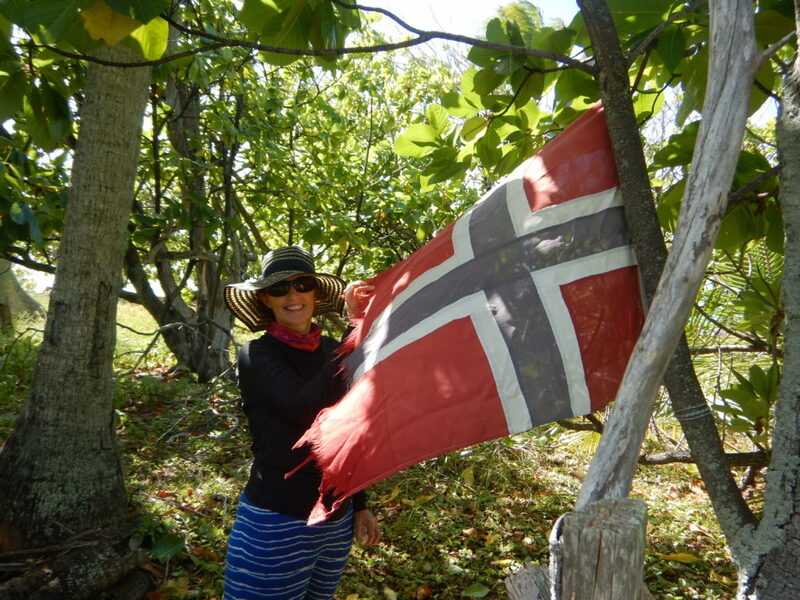 There were limes, avocado and we also picked some pamplemoes – so delicious and FREE! ^_^ It was pretty awesome. At some stage we also visited a souvenir shop, which had some pretty cool stuff in it. Karin and I were really fascinated by the tattoos. I remember hitting Rio de Janeiro for the first time and feeling overwhelmed by all the tattoos. Our circles back home has very few people with tattoos, so it was quite shocking. However, the surprise soon wore off. To tell the truth, I’m starting to wonder how I could ever have been shocked by tattoos at all. But I do still really dislike tattoos that don’t compliment the person. Generally I like something small and flowing. Big and gaudy don’t cut it. 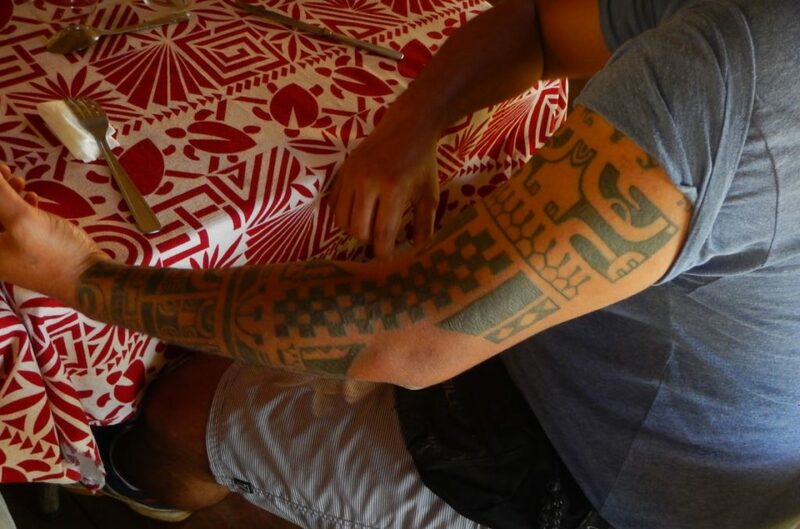 The Pacific tattoos fascinate us because they are geometric. Patterns and pictures, yes, but … complimenting. Of course, each symbol has a meaning: chess-board squared represent pi-pi rocks, certain lines are fish, many other symbols are specific to certain families. On the other side of the island we enjoyed a very good lunch and then visited a little museum before returning to the boat with all our spoils. 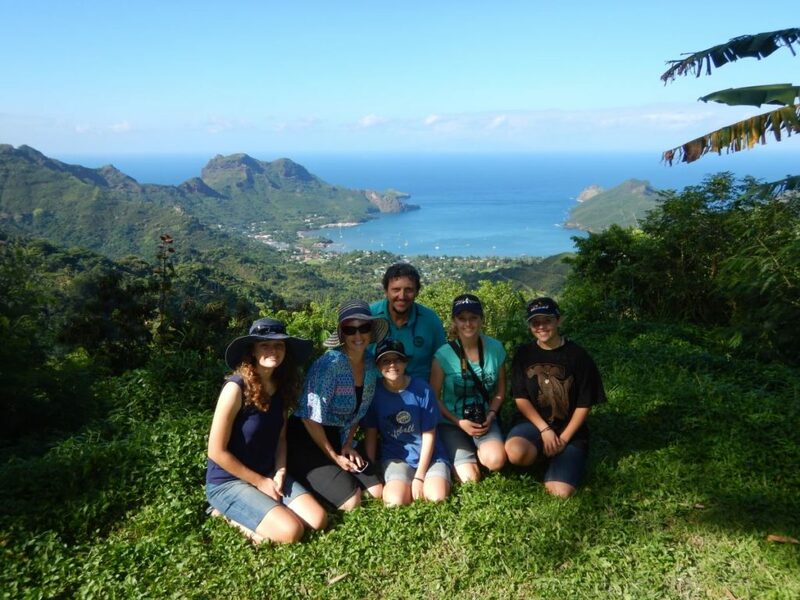 Nuku Hiva was a very good introduction to our time in the Pacific.